Angel Hotel & F Kirk Cup. Singles Knockout winner - James Gilpin. Singles Knockout runner up - Scott Moore. Doubles Knockout winners - Andrew Cass & James Moore. Doubles Knockout runners up - Matthew Garbutt & James Gilpin. Heaviest Fish in a competition* - Scott Moore - 11 lb 09 oz (28th November 2012). Heaviest Fish out of competition* - Andrew Cass - 12 lb 04 oz (2nd December 2012 - Cloughton Open). Christmas match winner - Dave Hambley - 21 lb 06 oz - 5 fish. 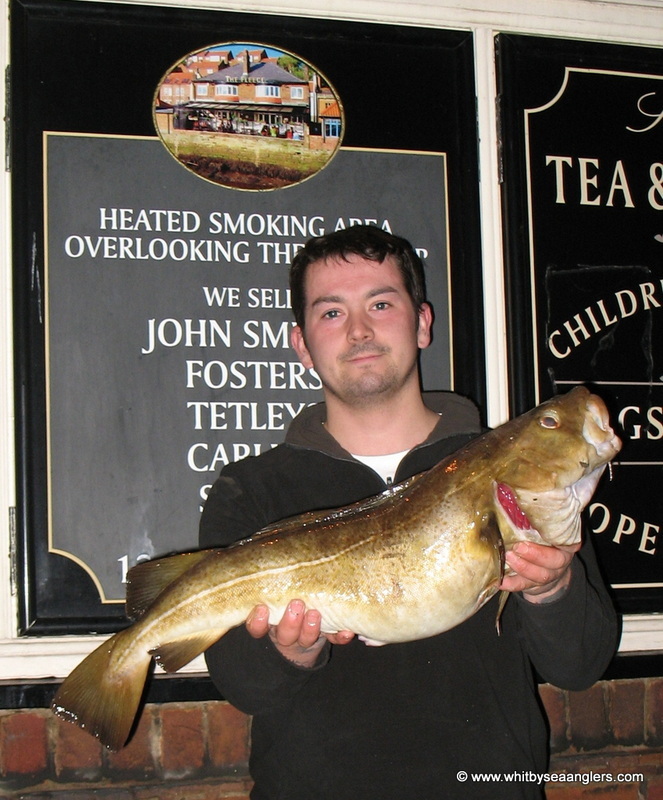 Christmas match Heaviest Fish - Matthew Garbutt - 10 lb 13 oz. Greatest number of fish - Matthew Garbutt - 220 fish. Heaviest Bag of Fish* - Matthew Garbutt - 31 lb 06 oz - 7 fish (25th November 2012 - 7 fish). 1st - Jay Allison* - 8 lb 02 oz - 2 fish (23rd December 2012 - Christmas match). Juniors Heaviest Bag of Fish* - Jay Allison - 8 lb 02 oz - 2 fish (23rd December 2012 - Christmas match). Juniors Heaviest Fish* - Jay Allison - 6 lb 06 oz (23rd December 2012 - Christmas match). Total weight for the season - 1,815 lb 11 oz. Total Number of fish - 1,208 fish. Wedesday 26th September 2012. 1 of 52. Wednesday night saw the start of the 2012 - 2013 Whitby Sea Anglers Associations' fishing season and members traditionally meet at the Band Stand before departing at 1845 hrs. 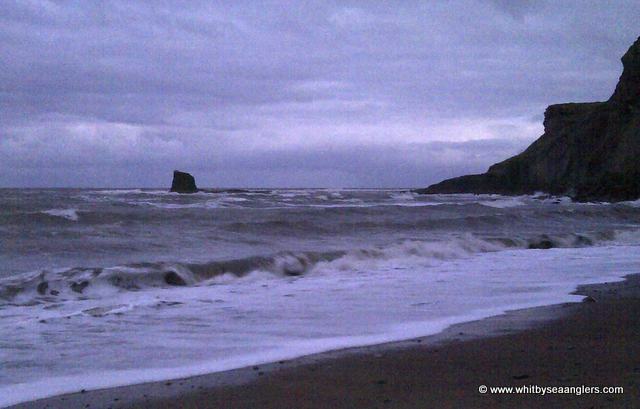 Low water was at 2028 hrs at a height of 1.9 metre, with a dying easterly swell, but a strengthening northerly wind. 9 of the 17 anglers whom fished were at the scales with 20 fish for 31 lb 11 oz. Denis Thompson was man of the match with 4 fish for 6 lb 13 oz. New members are always welcome and the weigh ins take place at the Fleece on Church street every wednesday and sunday evening between 2200 - 2230 hrs. Sunday 30th September 2012. 2 of 52. Low water 2312 hrs, 1.1 metre. Weigh in Fleece, Church Street. Sunday nights 4 hour match for Whitby Sea Anglers Association started an hour after high water. With flat calm sea conditions and a strong westerly wind, far from ideal. 10 anglers were at the scales with a varied selection of fish, cod, coalfish, dab, flounder, eel, whiting, rockling and 2 tadpole fish. 20 fish were weighed in for 23 lb 05 oz. 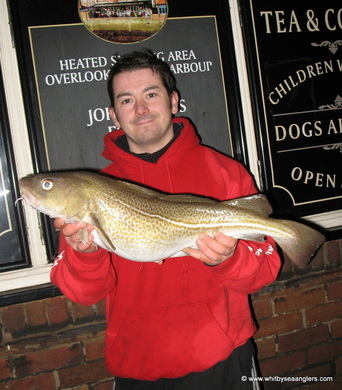 J Gilpin surprised the members with a red cod of 5 lb 10 oz and B Laws caught the 2 tadpole fish (heaviest 0 lb 13 oz). N Inglis was man of the match with a mixed bag for 6 lb 09 oz. WSAA now has its first female member, Paula Midgley of Whitby Seafishing Supplies and was straight to the scales with a whiting. New members are always welcome. The singles and doubles knockouts will be drawn on sunday night, any members not registered are urged to do so before then. Wednesday 3rd October 2012. 3 of 52. High water 1836 hrs 5.3 metre. Wednesday nights 3 hr match started a ½ hr after high water 5.3 metre. With flat calm sea conditions and a strong south south westerly wind and the occasional rain shower, conditions were far from ideal. 13 members of Whitby Sea Anglers Association were at the scales with another assortment of fish, flounders, eels, whiting and codling. 55 fish for a total weight of 41 lb 09 oz. Rob Allison has entered the heaviest fish for October with a codling of 3 lb 08 oz and Matthew Garbutt with the heaviest bag of fish for 11 lb 02 oz. Sunday 7th October 2012. 4 of 52. High water 2105 hrs 4.4 metre. Sunday nights 4 hrs match started 3 hrs before high-water, 4.4 metre at 2105 hrs. With a good sea running, on the flood, anglers were hopeful of a fish or two. With very little wind and clear skies it quickly turned chilly. Twelve members of Whitby Sea Anglers Association were at the scales to weigh in 41 fish for 46 lb 10 oz, with many small codling, billets, flat fish and eels, a small crowd soon gathered to watch. 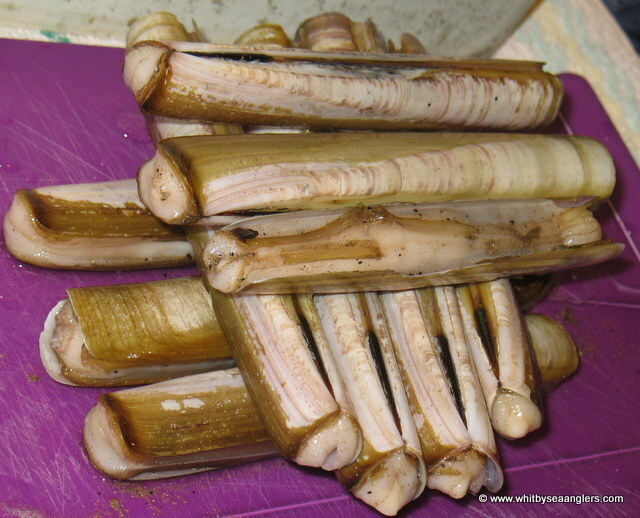 Being the first run of sea this season it proved hazardous to many an anglers tackle with plenty of weed reported from heavy kelp storks to pounds of fine sea grass. One venue was reported 'as wick with fish' but you could not them out because of the weed. 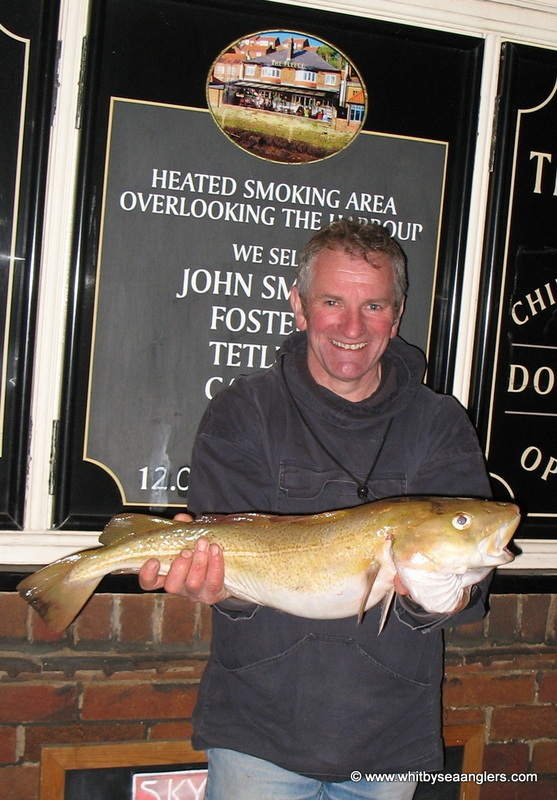 Colin Stainthorpe caught the heaviest fish of the night 4 lb 00 oz codling, which puts him in the lead for the monthly sweep. Scott Moore was man of the match with 7 fish for 10 lb 04 oz. Wednesday 10th October 2012. 5 of 52. Andrew Cass, WSAA - 8 lb 09 oz. Low water 1835 hrs 2.4 metre. Wednesday nights 3 hrs match for Whitby Sea Anglers Association started 1/2 hr after low water on a dead tide, 2.4 metre. With a dying swell and a chilly wind varying from south west to south east, far from ideal conditions. However 10 anglers were at the scales with 30 fish for 29 lb 07 oz. Andrew Cass was man of the match with 2 codlings for 10 lb 10 oz, the heaviest fish being 8 lb 09 oz, photograph by Peter Horbury. Andrew now takes the lead in the Heaviest Fish of the month sweep stake. A Cass 8 lb 09 oz beat M Garbutt 6 lb 12 oz. N Inglis 1 lb 04 oz beat B Laws 0 lb 06 oz. 10th - B Laws with 1 fish for 6/16oz. Sunday 14th October 2012. 6 of 52. Neil Inglis, WSAA - 8 lb 07 oz. Low water 2206 hrs 1.0 metre. Sunday nights 4 hr match started 2 hrs after high water 5.4 metre and finished just before low water on a 1.0m ebb. With a growing sea, plenty of colour in the water and a north easterly wind, conditions were favorable for a few fish. Members of Whitby Sea Anglers Association did report surging and plenty of drag nearing low water. Weed was also a major factor in many marks. 14 anglers were at the scales with an impressive 64 lb 03 oz of fish. Neil Inglis was man of the match with 7 fish for 16 lb 12 oz, the heaviest being 8 lb 07 oz, photograph by Peter Horbury. Neil did report losing another good fish when his swivel got jammed in the end eye of his rod. Neil now takes the lead for the Heaviest Bag of Fish for the month but his heaviest fish was 2 + ounces short of taking Heaviest Fish of the month, currently held by Andrew Cass 8 lb 09 oz. N Inglis has regained 1st place, but by only 06 oz from D Perrett. 20th - M Beedle with 1 fish for 12/16oz. Wednesday 17th October 2012. 7 of 52. High water 1800 hrs 5.9 metre. Wednesday nights 3 hr match was the 1st round of the Singles Knockouts for Whitby Sea Anglers Association members. The match started 1 hr after high water 5.9m, with a fast dying north easterly swell being knocked back by the south easterly wind. It was a warm evening and less than favorable conditions forced anglers to resort to scratching for whatever they could catch. 13 anglers were at the scales with 34 fish for 26 lb. Matthew Garbutt was man of the match with 10 whiting for 5 lb 15 oz. Dave Hambley caught the heaviest fish of the night with a codling of 4 lb 06 oz. After every match anglers recount their misses and loses, and last night was no different. Dave Perrett reported he had lost a good fish which had become snagged and could not be lifted for one reason or another. Snapping his main line, the fish was lost (or was it?). However, being a big tide, I returned with Dave later that night to the foot of the cliff mark where he had been fishing. It was not long before I found his fish, snagged in the rocks, still hooked. Weighed later it was good codling of 6 lb 14 oz. Could this cost Dave the Whitby Sea Anglers Association title? Time will tell!! We are still open for new members and it's only a couple of weeks to our annual open, Sunday 18th Nov. 2012. Peter Horbury beat James Moore. Dave Perrett V Bernard Vasey. Sunday 21st October 2012. 8 of 52. Low water 1510 hrs 1.8 metre. High water 2117 hrs 4.9 metre. Sunday nights 4 hr match saw a poor turn out of members of Whitby Sea Anglers Association due to the less than favourable sea conditions. 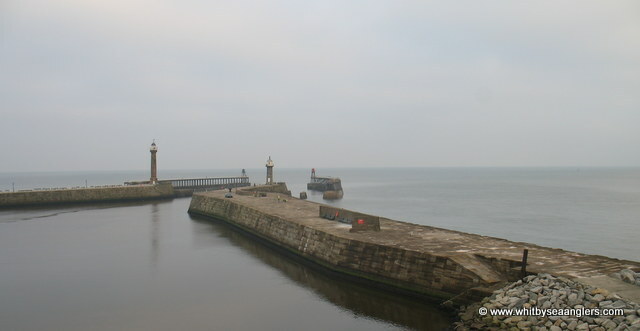 A pretty slack tide, a slight north easterly swell and a gentle cold breeze saw Whitby shrouded in thick fog. Scratching for whatever was available on a flooding tide with high water at 2117 hrs 4.9m with eels, flat fish, whiting, rocklings and a few codling weighed. Rob Allison was man of the match with 5 fish for 8 lb 08 oz. 7 anglers weighed in 35 fish for 26 lbs 06 oz. Members are reminded the Doubles Preliminary round takes place on wednesday. Sunday nights match concluded the 3rd monthly match the WSAA Teams (A, B, C) could enter in to the Clubman Series run by Alan Yates at Sea Angler Magazine. 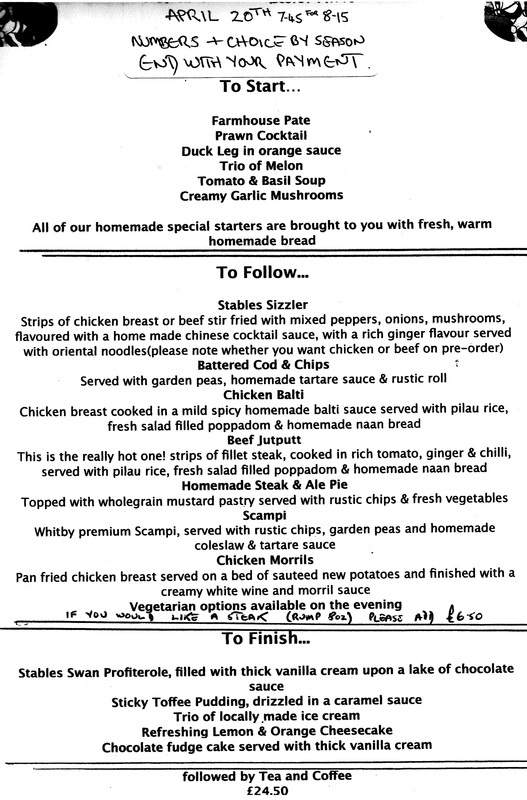 Further details of which can be found on the Clubman menu. Wednesday 24th Oct 2012. 9 of 52. Low water 1900 hrs 2.2 metre. Wednesday nights 3 hr match started right on low water on a very slack tide, 2.2 metre low and a 4.5 metre high. North easterly wind and a slight, but growing north easterly swell came too late to improve the already poor conditions. 17 members of Whitby Sea Anglers Association fished with only 9 anglers at the weigh in, with 18 fish for 18 lb 10 oz. Rob Allison was man of the match with a fine codling of 6 lb 04 oz. 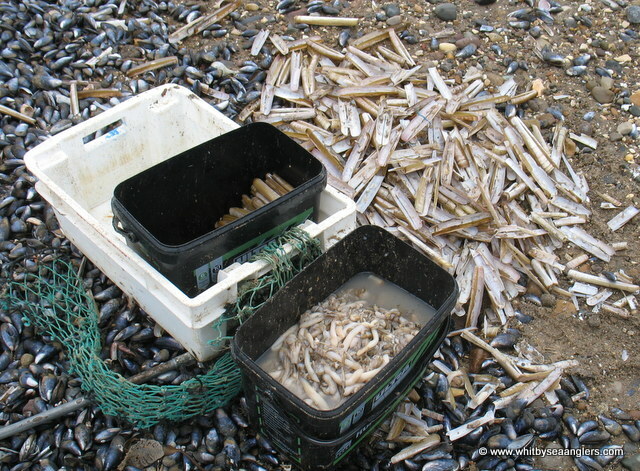 With only a few whiting weighed, the rest consisted of small codling, flat fish, rocklings, billets and eels. Hopefully with the weather forecasters predicting snow and sleet and strong winds, fishing conditions should improve. Doubles preliminary Round P Horbury and R Cope go through. M Bowman 0 lb 00 oz. In a singles match D Perrett 0 lb 10 oz beat B Vasey 0 lb 00 oz. Sunday 28th Oct 2012. 10 of 52. High water 1502 hrs 5.2 metre. Low water 2113 hrs 1.4 metre. Sunday nights 4 hr match started mid tide with low water at 2113 hrs 1.4 metre for Whitby Sea Anglers Association members. The strong north easterly swell we saw on saturday, was quickly being knocked back by the westerly wind, which was enhanced by the ebbing tide. Less than favourable conditions for club members but there was a good turn out with 13 anglers at the scales. 37 fish were weighed in for heaviest total so far this season of 70 lb 15 oz. The heaviest fish of the night 7 lb 14 oz caught by Matthew Garbutt, was just part of a bag of 6 codling and 1 billet for 23 lb 04 oz (who also took man of the man). Which incidentally is also the heaviest bag of fish this month and the season so far. 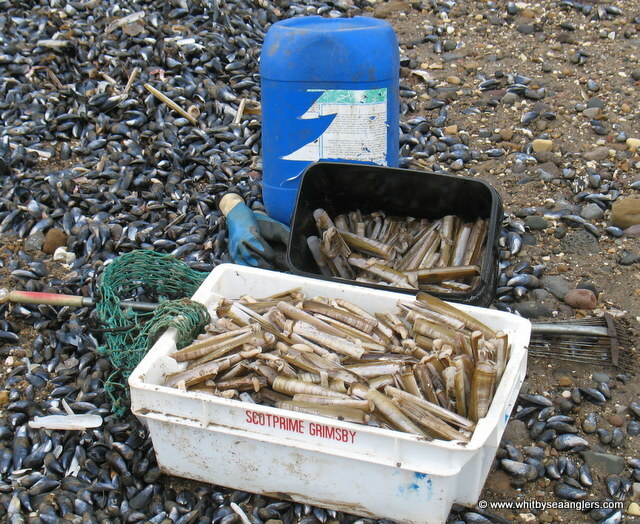 Weed was a common problem reported by many anglers after the rough seas over the last few days. Matthew Garbutt has extended his lead by a whopping 24 lb 02 oz. J Gilpin beat (3 lb 12 oz) beat W Atkinson in a singles match. Wednesday 31st Oct 2012. 11 of 52. High water 1638 hrs 5.3 metre. Low water 2253 hrs 1.2 metre. Wednesday nights 3 hr match started 2½ hrs after high water 5.3 metre in far from favourable conditions strong southerly winds, flat calm sea with rain and sleet thrown in. By 2000 hrs the wind had died and the rain increased. However, 11 members of Whitby Sea Anglers Association were at the scales with 20 fish for a total of 15 lb 14 oz. Tonight's weigh in is the worst of the season so far, but for the month of October 312 fish were weighed in for 339 lb 10 oz. In the monthly sweeps Matthew Garbutt had the Heaviest Bag of Fish 23 lb 04 oz, caught on the 28th Oct. and Andrew Cass caught the Heaviest Fish of the month 8 lb 09 oz on the 10th Oct. Sunday is Filey Open. In the Leader Board Matthew Garbutt still has a commanding lead of 21 lb 13 oz. Sunday 4th Nov. 2012. 12 of 52. Colin Stainthorpe, WSAA - 7 lb 12 oz. Sunday nights 4 hr matched started an hour before high water 4.9 metre. 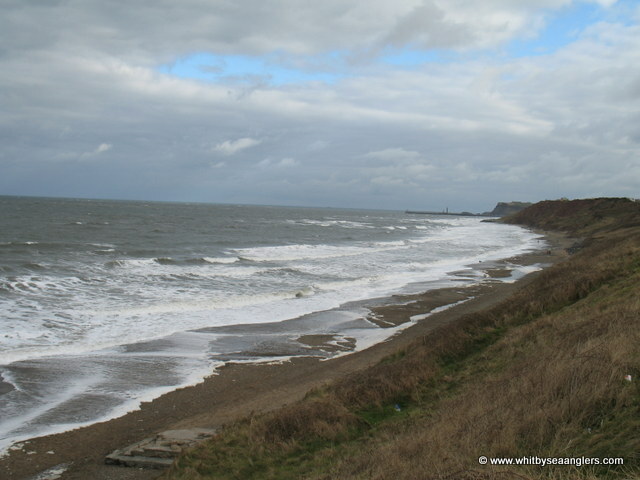 With a north easterly wind, there was a definite chill in the air and some long distance northerly swell. With a virtually cloudless night anglers watched as a very bright red moon rose above the horizon. With no reports of weed 13 anglers were at the scales with 35 fish for 46 lb 13 oz. 6 lb 07 oz respectfully. 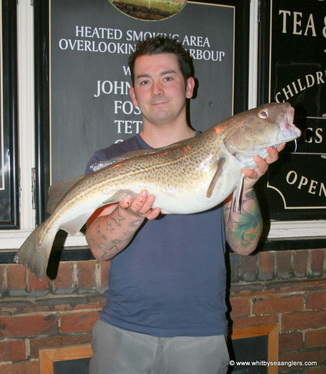 7 lb 12 oz cod, photograph by Peter Horbury. Colin's second fish made a total weight of 8 lb 11 oz, for the Heaviest Bag of fish of the month. Wednesday 7th Nov, 2012. 13 of 52. Low water 1526 hrs 2.4 metre. High water 2135 hrs 4.5 metre (a very slack tide). 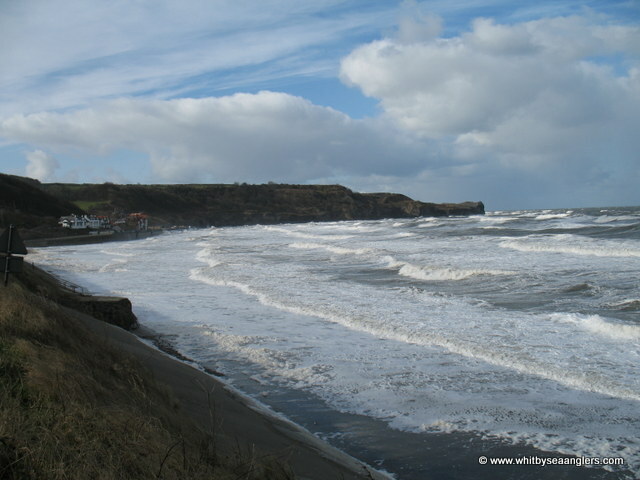 Wednesday nights 3 hr match took everyone at Whitby Sea Anglers Association by surprise, where did the swell come from? Early afternoon there was hardly any swell to speak of, yet by the start of the match there was north easterly swell and it was growing. The strong westerly wind was not knocking it back as one would have expected. With plenty of colour in the water, prospects for a fish or two looked good despite the very slack tide. Fishing the last 2½ hrs of a flood tide and a ½ hr of ebb, 10 anglers were at the scales with 30 fish for 41 lb 08 oz. The weigh in consisted of whiting, but predominantly codling with both Rob Allison and Ian Simpson, each catching a codling of 5 lb 11 oz. Man of the match was Rob Allison with 4 fish for 9 lb 05 oz. The next round of the singles knockouts were fished tonight, results are shown on the Main menu - Knockout Competitions - Singles. Sunday 11th Nov. 2012. 14 of 52. Sunday nights 4 hrs match started nearly 2 hrs before low water 1952 hrs 1.5 metre. With some long distance north westerly swell, a little colour and an increasing southerly wind it was once again a scratching night. Dave Hambley caught the fish of the night, a bright eyed, fresh run codling of 5 lb 08 oz. Matthew Garbutt was man of the match with a mixed bag of whiting and flatties 12 fish for 7 lb 14 oz. 9 anglers were at the scales with 31 fish for 26 lb 09 oz. Top tip of the night is to keep ones fish in a secure fish bag, stops them falling out!! Wednesday 14th Nov. 2012. 15 of 52. Wednesday nights 3 hrs match finished 16 mins before low water 2216 hrs 0.6m, with a high pressure of 1030mm on the barometer, was more like a summers evening. A gentle southerly wind and with flat calm sea conditions, anglers were forced to try and find somewhere with some tidal flow resorting to scratching for whatever was available. 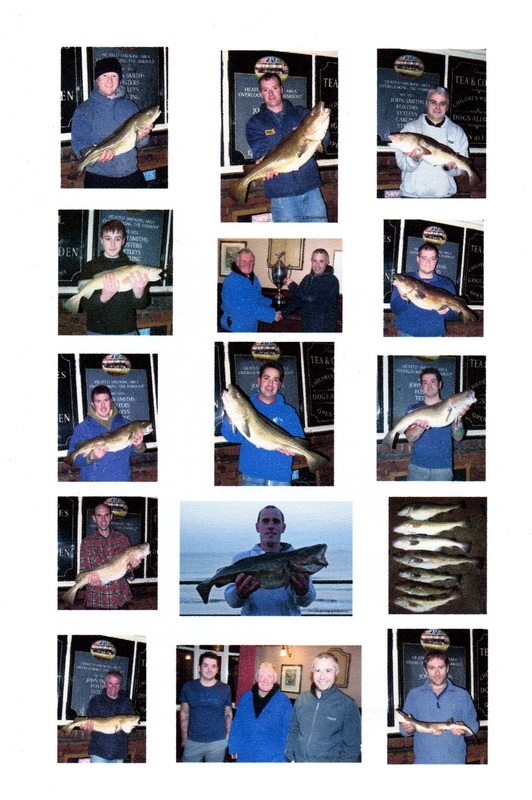 Ten members of Whitby Sea Anglers Association were at the scales with 26 fish for 18 lb 08 oz. Once again Matthew Garbutt was man of the match with a mixed bag of fish, a lesser spotted dog fish, a bull head, a whiting and some flatties, 6 fish for 4 lb 11 oz. Due to prior commitments only one doubles match was fished, see Doubles page. Sunday 18th November is of course WSAA Annual Open Match. A sponsor has given £20, in to the prize fund for the ‘smallest fish’ (by weight for a single fish’, within size limits). Open winner Pete Dunn, his HF, a cod of 12 lb 00 oz. Fishing from 1000 – 1600 hrs. Low water was at 1300 hrs at a height of 1.4 metre. Conditions were far from favourable with bright clear skies, some colour in the water and little to no swell. With a gentle southerly wind, 103 seniors and 3 junior anglers, embarked on a scratching match knowing that just one fish would get them to the prize table. With £500 for 1st, £300 for 2nd and £200 for 3rd places, thereafter, there was a remarkable list of prizes from our generous sponsors. Value of prizes awarded, including cash, vouchers and goods, came to over £2,000. 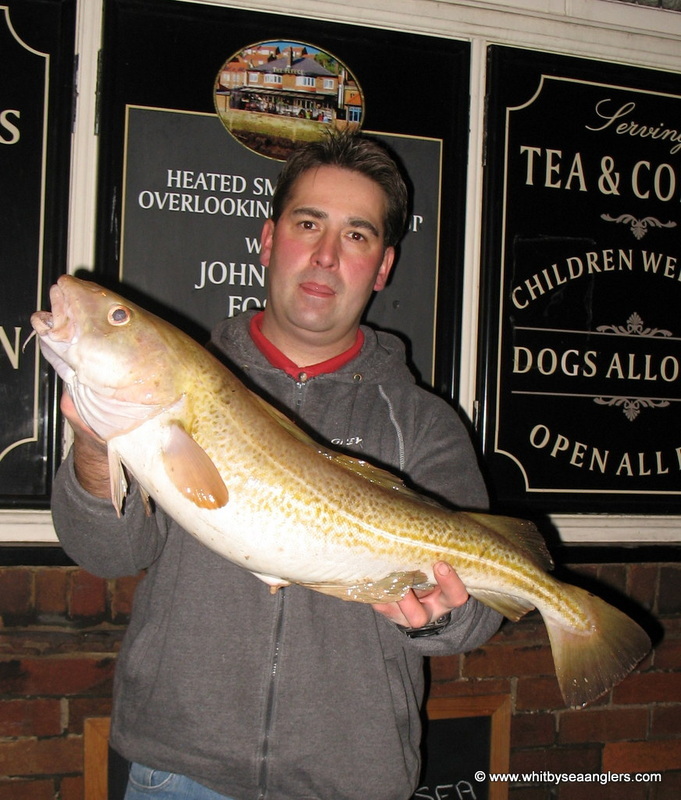 Congratulations also to Ian Thompson, from Scarborough, 2nd place with 4 fish for 8 lb 02½ oz. Congratulations also to Gary Pye, from Peterlee, who had the second heaviest fish, a pollack of 4 lb 14½ oz and 3rd overall with 2 fish for 6 lb 11 oz. 2nd wins 1/3rd, £68 - Gary Pye - 4 lb 14½ oz. Congratulations to Gary Pye, from Peterlee, 3rd overall, but this pollack of 4 lb 14½ oz got him 2nd place in the super pool. Congratulations to Pete Dunn, from Scarborough, winner of the 33rd WSAA Open, sharing a 'short joke' with Chairman W Atkinson. Congratulations to 2nd place Ian Thompson, from Scarborough, 8 lb 02 1/2 oz with Chairman W Atkinson. 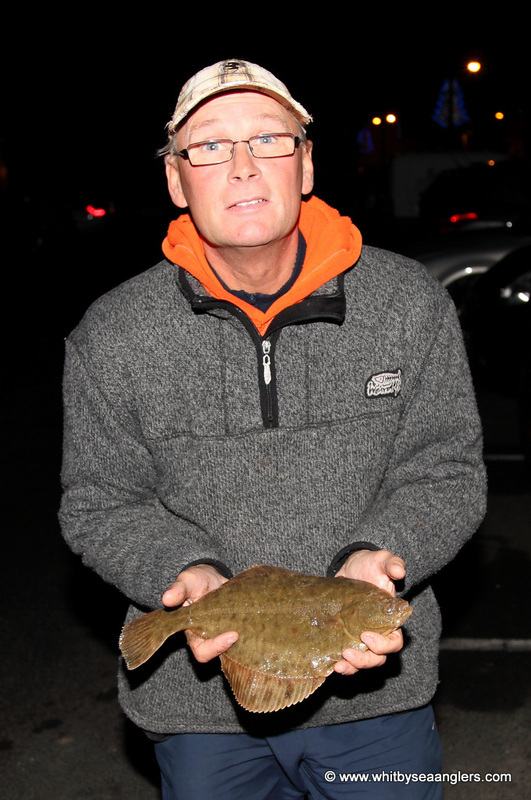 Congratulations to Chris Wood, from Redcar, for the heaviest flat fish of 1 lb 01 oz received £50 sponsored by Mick Beedle local builder and WSAA member. 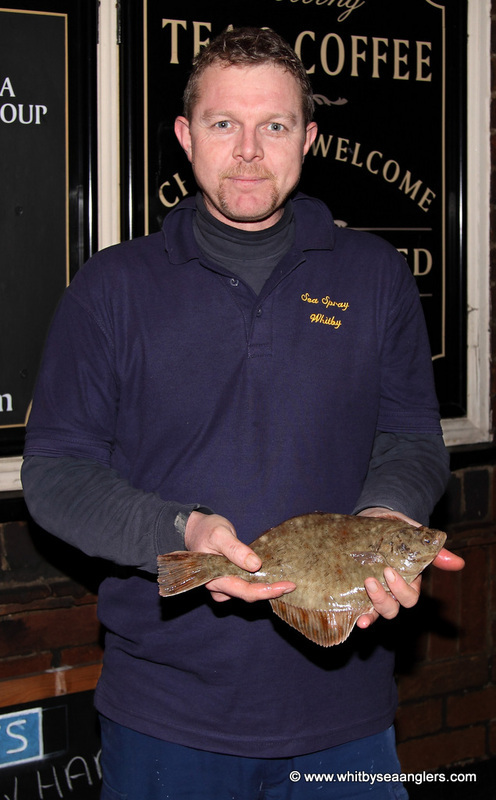 Richard Deadman, from Thorpe Willoughby, 26th with this flat fish of 13 1/2 oz. Link to other photographs of the day taken by Richard Saltmarsh. Wednesday nights 3 hrs match was fish on a flooding tide up to virtually high water, 2209 hrs 4.6m. With a little swell, which was growing, aided by the chilling northerly wind. The local beaches were the choice locations for many members of Whitby Sea Anglers Association, with plenty of colour in the water from recent heavy rain. However leaves and grass, wash down the streams and becks was a problem, fouling lines and rigs. 10 anglers were at the scales with 61 fish for 43 lb 13 oz. Predominantly whiting being the main catch, W Atkinson had a flat fish of 1 lb 05 oz (16" long) and C Stainthorpe had the only codling of 1 lb 03 oz. In a singles match D Perrett 1 lb 07 oz beat M Pitman 0 lb 00 oz. In a doubles match J Moore & A Cass (single handedly 9 lb 01 oz) beat M Pitman & B Laws 0 lb 00 oz. Wednesday 28th Nov. is the next round of the singles knockouts. D Perrett V S Moore. Sunday 25th Nov. 2013. 18 of 52. After a very successful 33rd Annual Open Match for Whitby Sea Anglers Association, many thanks to all our sponsors, normal service resumed at Whitby Sea Anglers Association. Weigh master James Gilpin and club secretary Peter Horbury were kept very busy tonight with multi visits to the scales for 4 anglers and four anglers photographed for the web site gallery. Sunday nights 4 hr match started with a fresh westerly wind, which slowly moved round to the north west. With some north westerly swell, quickly dying as low water approached, but after the tide had turned, the swell kept increasing. Plenty of colour in the water with all the recent rain fall. 12 anglers were at the scales with 32 fish, for our best weigh in this season of 99 lb 04 oz, with four double figure bags of fish. Matthew Garbutt was at the scales twice for a combined weight of 31 lb 06 oz, the Heaviest Bag this season. His third visit, to the scales was to confirm the weight of his biggest fish 9 lb 11 oz. Neil Inglis weighed in 16 lb 08 oz and on his second visit pipped Matthew Garbutt for the heaviest fish by ½ oz, 9 lb 11 ½ oz. Two other anglers, Martin Lamb and Richard Cope had second visits to the scales with fish of 7 lb 09 oz and 7 lb 15 ½ oz respectively. In a doubles match P Horbury and R Cope (11 lb 09 oz) beat M Lamb and P Midgley (9 lb 13 oz). The doubles semi finals are on December 5th. Members are reminded the next round, the semi finals, of the singles knockout is on Wednesday night. 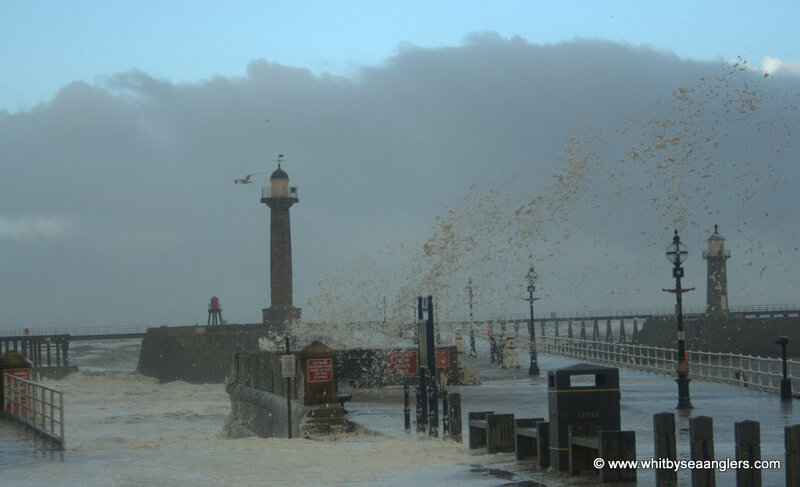 In other news – Whitby Sea Anglers Associations' Insurance will cover the Ship Inn Open on Sunday 30th December 2012. Neil Inglis, WSAA, Sunday 25th November 2012. 9 lb 11 1/2 oz. Heaviest Fish of the month of November. Photograph by Peter Horbury. Matthew Garbutt, WSAA, Wednesday 28th November 2012. 8 lb 02 oz. Photograph by Peter Horbury. Richard Cope, WSAA, Sunday 25th November 2012. 7 lb 15 1/2 oz. Photograph by Peter Horbury. Wednesday 28th Nov. 2013. 19 of 52. Low water 21.59 hrs 1.3 metre. The last match of November 2012 for Whitby Sea Anglers Association members, 3 hrs of fishing in some arduous and unpleasant conditions. With a good north easterly swell running and a north westerly wind, hail, sleet and torrential freezing rain did not dampen the spirits of Whitby Sea Anglers Associations' members. Fishing down to low water, with plenty of colour in the water, weed was a crucial factor at many marks, forcing anglers to move marks through out the match. Ten anglers were at the scales with 29 fish for 81 lb 14 oz. Three double figure bags and one double figure fish (the first of the season). Ben Laws was early to the scales with 4 fish for 18 lb 08 oz (his best 6 lb 04 oz). Matthew Garbutt, next, did not disappoint with 7 fish for 19 lb 09 oz (his best 8 lb 02 oz, photograph by Peter Horbury.). 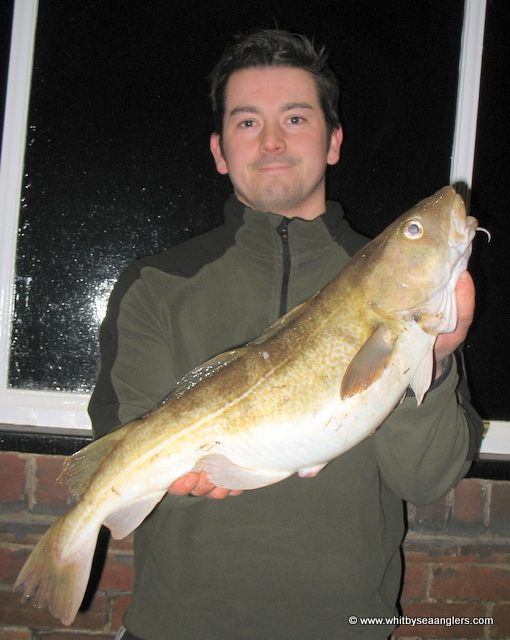 11 lb 09 oz, (photograph by Peter Horbury) and another codling for a total bag of 14 lb 00 oz. Scott later confided that his chosen mark had produced too many blanks this season and this was the last time to redeem itself. In the only singles knockout fished tonight, Dave Perrett was beaten by Scott Moore. Matthew Garbutt has extended his lead over second place Neil Inglis, to a jaw dropping 71 lb 01 oz and we are not half way through the season!! 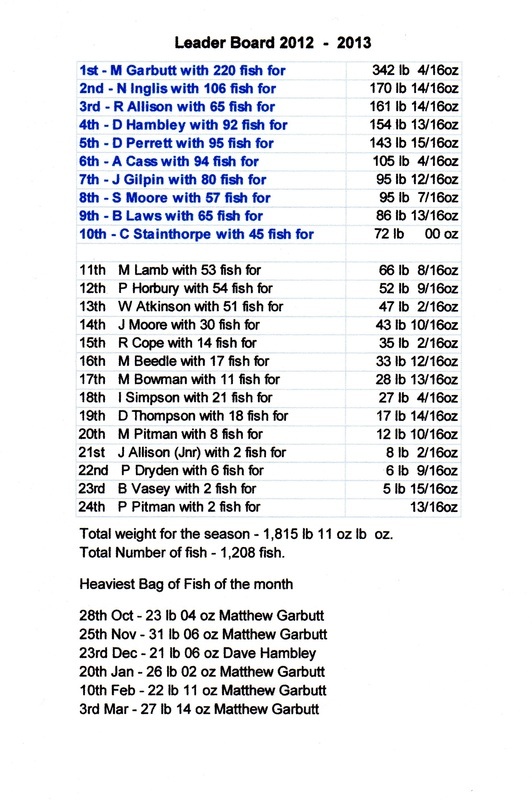 In the Heaviest Bag and Heaviest Fish Sweeps, M Garbutt won Heaviest Bag with 31 lb 06 oz on 25th November and Scott Moore Heaviest Fish with 11 lb 09 oz on 28th November 2012. That concludes November’s fishing with a total of 253 fish caught for 370 lb 11 oz. Matthew Garbutt, WSAA - 8 lb 02 oz. Scott Moore, WSAA - 11 lb 09 oz. Heaviest Fish of the season, but for how long? Sunday 2nd December 2012. 20 of 52. Sunday nights 4 hr match started right on high water 17.57 hrs 5.2 metre, with a good north westerly swell and a light westerly wind, anglers were looking forward to a bountiful nights fishing. Plenty of colour in the water, unfortunately a cloudless night with a bright moon, it was however not going to be an easy night as temperatures plummeted below freezing. The favourable sea conditions were not as fruitful as everyone expected with only 2 double figure bags and only 9 anglers at the scales. 19 fished weighed in for 47 lb 04 oz. Man of the match was weigh master James Gilpin with 3 fish for 10 lb 11 oz, with the heaviest fish of the night, 7 lb 14 oz, (photograph by Peter Horbury). This bag of fish has lifted James from 10th to 5th in the Leader Board. The last singles semi final knockout was fished tonight, Neil Inglis was beaten by James Gilpin (with only 4 ounces in it). Both Neil and James caught the only 2 double figure bags of the night. 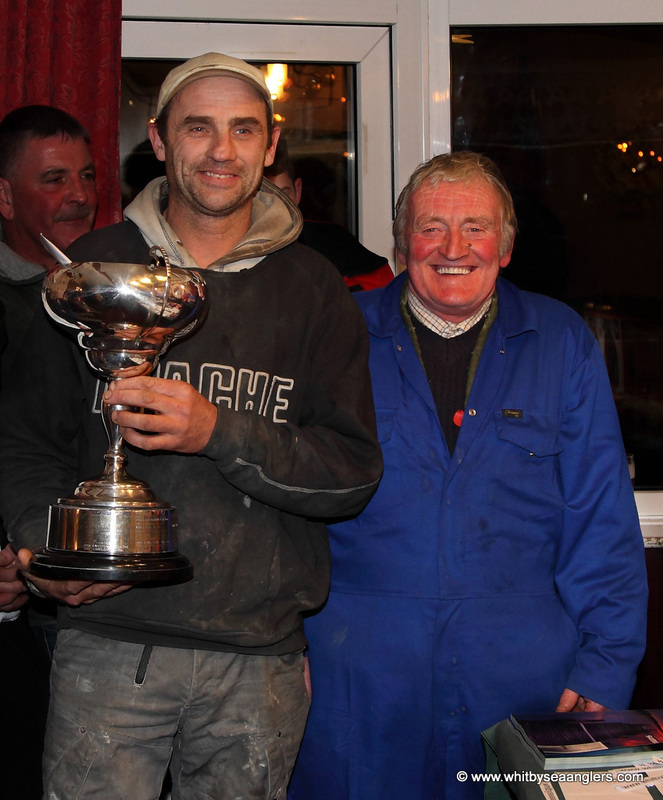 The Singles Final between James Gilpin and Scott Moore is due to be fished on the Wednesday 19th December. 12 lb 04 oz, (photograph by Peter Horbury). This fish was caught during the Annual Cloughton Open Match in which Andrew came second to Chris Scaife, who had a cod of 16 lb 14 oz. The Doubles Semi Finals are due to be fished on Wednesday 5th December. Matthew Garbutt & James Gilpin. Andrew Cass & James Moore. Andrew Cass, WSAA - 12 lb 04 oz, Heaviest Fish out of a WSAA competition. 2nd Place in the Cloughton Open. James Gilpin nee King Cod, WSAA - 7 lb 14 oz. Wednesday 5th December 2012. 21 of 52. 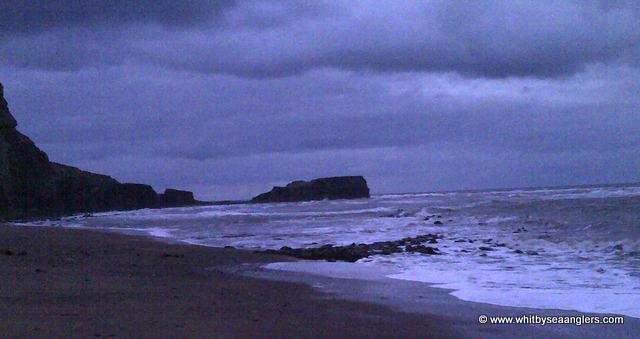 Wednesday nights 3 hr match was fished over high water, 20.00 hrs 4.9 metre, with a strong and surging northerly swell. With an even stronger icy north north westerly wind making conditions uncomfortable. After the first hour many members packed up and moved to another venue as they found their chosen mark unfishable. Travelling to venues brought caution at Runswick Bay bank as two abandoned cars fore warned drivers of thick ice and no salt on the bank. Members that parked at the bank top car park were back to their cars, changing venues, within an hour as weed crippled any attempt to fish. Members reported eleven rods at Port Mulgrave and only two fish before 10pm, well done Colin. Fine grass like weed, surges and tidal pull after high water did not help the already arduous conditions. Other factors were ill equipment anglers hampering others with tackle that was too light for the weather and sea conditions. 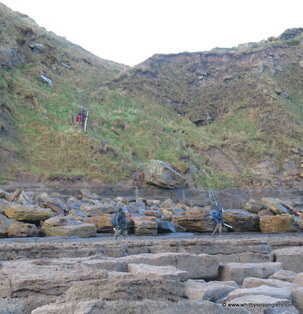 Saltwick was full of weed and was constantly over whelmed with white water as the tide surged. Again, members moved elsewhere. Those at Robinhoods Bay reported poor road conditions and no shortage of weed. Neither of the Doubles knockout matches were fished due to illness and work commitments. Those 6 members of Whitby Sea Anglers Association that managed to find somewhere to fish brought back a better stamp of fish around the 5 lb mark. Dave Perrett taking man of the match with 2 fish for 9 lb 12 oz, the heaviest being 7 lb 12 ½ oz. 1½ ounces short of equaling James Gilpin’s Heaviest Fish for Decembers sweep, caught on Sunday 2nd December. 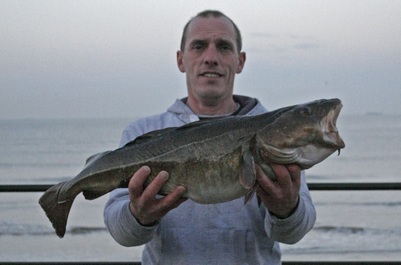 11 codling were weighed in for 36 lb 14 oz. Sunday 9th December 2012. 22 of 52. Mike Bowman, WSAA - 9 lb 00 oz. Extreme weather conditions saw Sunday nights 4 hr match start just before low water 1819 hrs 1.9 metre. With a strong northerly swell running, an even stronger and increasing northerly wind which slowly swung around to north westerly, bringing rain and hale trying to dampen members spirits. 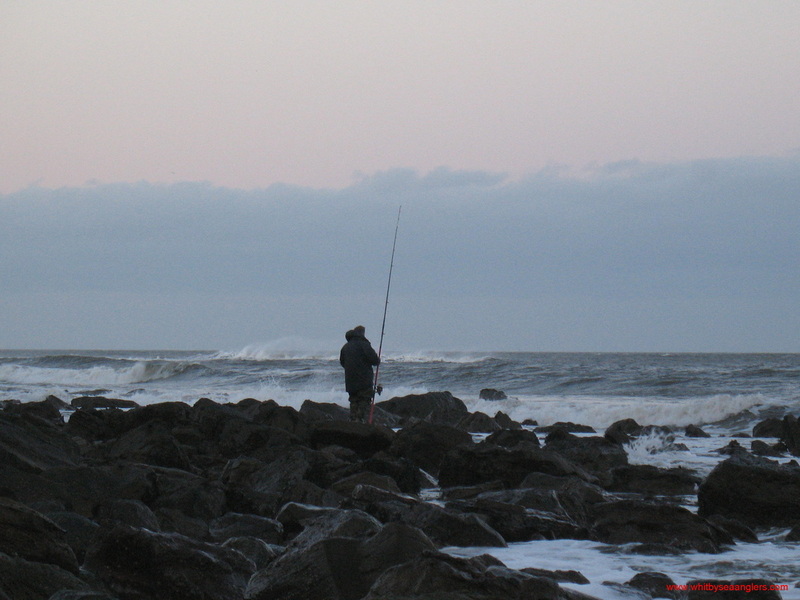 Once the tide had turned the swell and surging increased, making marks ‘white out’ and unfishable, anglers were forced to move to more sheltered marks. Weed, again hampered many members of Whitby Sea Anglers Association and pleasure anglers alike, who were forced to move (yet again) to another mark, losing precious time for fishing. 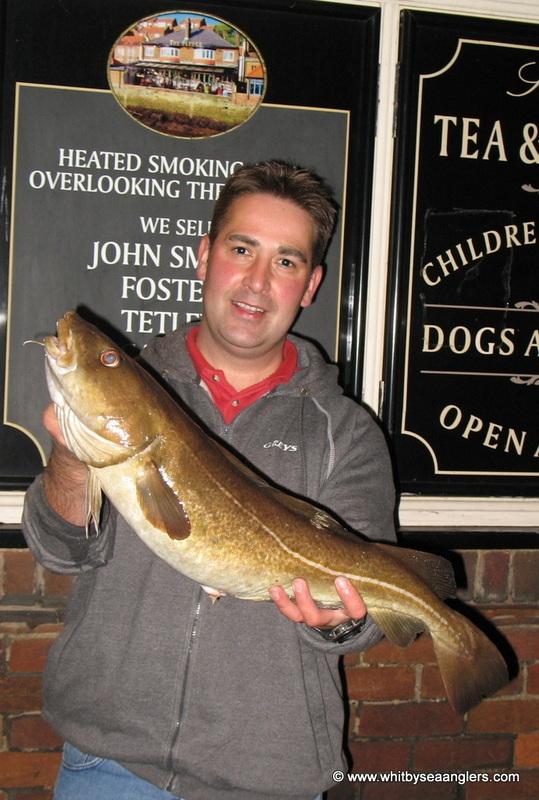 Mike Bowman was man of the match with 1 codling for 9 lb 00 oz (photograph by Peter Horbury). 6 anglers weighed in 8 fish for 28 lb 00 oz. Mike’s fish takes the lead for Decembers Heaviest Fish of the month. Once again due to illness and work commitments no doubles knockout matches were fished. 8 codling were weighed in for 28 lb 00 oz. Wednesday 12th December 2012. 23 of 52. Wednesday nights 3 hr match, for Whitby Sea Anglers Association members was fished through low water 21.14 hrs 0.8 metre and the start of the flood. With some long distance, regular north easterly swell, members set off to their chosen marks hopeful of a fish or two. Plenty of colour in the water but with a cloudless sky, temperatures soon plummeted as a chilly south easterly wind started to blow. For many members the fish were just not there as expected and as the tide turned the swell had dropped right off. Knocking back any hope of a fish on the flood. Rob Allison was man of the match, as only 6 members weighed in 8 fish for 25 lb 12 oz. Rob had 2 fish for 11 lb 04 oz. The doubles match between D Perrett & S Moore V A Cass & J Moore will be fished again on sunday as all failed to weigh in. Members are reminded £10 is due (in advance) for the Christmas match, fishing 2pm - 7pm, on Sunday 23rd December 2012. In other news, the landlord of the Fleece, Lee Gale, has informed members that they will be open on Sunday 13th January 2013 and then closed for 6 weeks. A full refurbishment and building works are being undertaken. Open again approximately 25th February 2013. Members will be kept informed. Sunday 16th December 2012. 24 of 52. Mick Beedle, Redcar Navy & Gentlemans Open Match winner - 10 lb 08 oz. 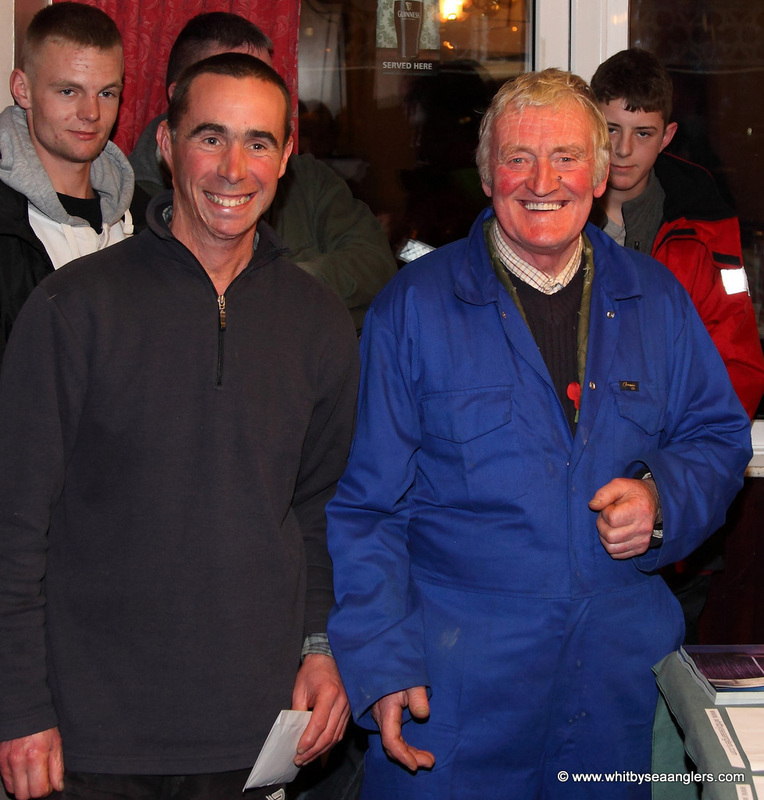 Whitby Sea Anglers Association would like to send a heart felt congratulations to Mick Beedle who, on Sunday 16th December 2012 won the Redcar, Navy and Gentleman's Club Open Match. It was a Heaviest Fish Open match. With a 10 lb 08 oz cod caught on his first cast of the competition. 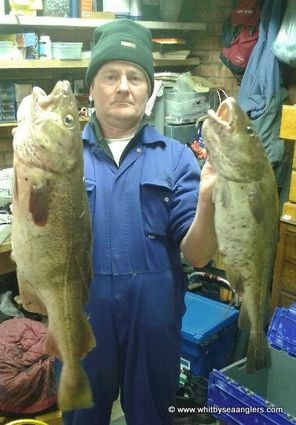 This,10 lb 08 oz cod, being Mick's first double figure fish and his first Open Match win, well done from all at Whitby Sea Anglers. Whitby Sea Anglers Association fished the 4 hr sunday match, 6pm-10pm, during extreme calm, no swell, no wind, but plenty of colour in the water. Fishing from high water 1801 hrs on a large tide of 5.8 metre, and once the tide got a hold the tide ebbed very quickly. The beaches were very popular as members resorted to scratching for whatever was available. 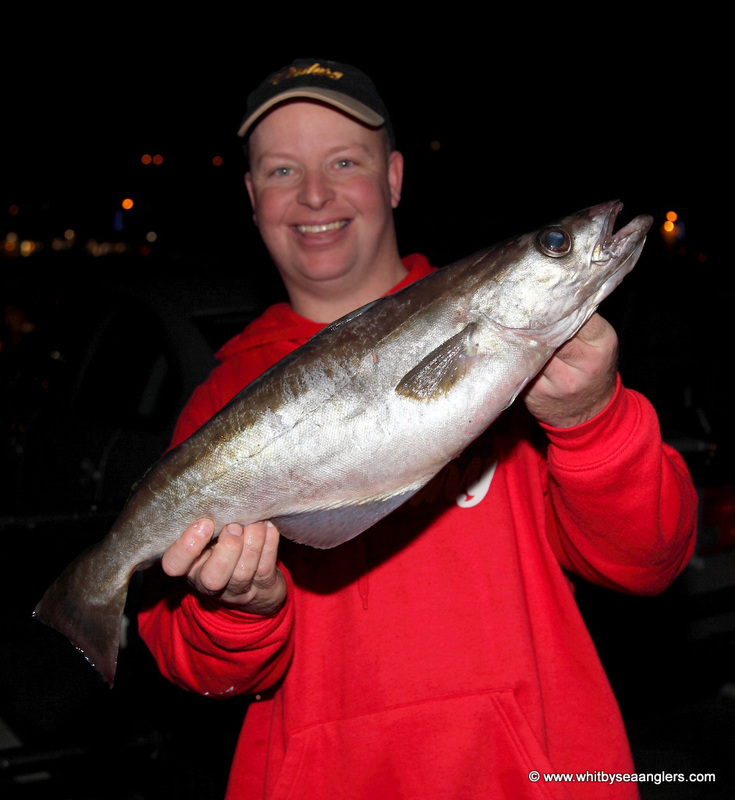 Rob Allison caught the heaviest fish of the night, a codling of 5 lb 01 oz. Andrew Cass was man of the match with 14 fish, an assorted bag of flatties and whiting. 16 members were at the scales with 119 fish for 96 lb 01 oz (3 lb 03 oz short of the seasons best weigh in). The Doubles Knockout semi finals were finally fished. A Cass & J Moore (14 lb 12 oz) beat D Perrett & S Moore (12 lb 02 oz). M Garbutt & J Gilpin and A Cass & J Moore will take place in the New Year on wednesday 2nd January 2013. Filey fishing club (last years winners of the Bell Trophy) have announced this seasons Inter-Club Tournament will take place on Sunday 27th January 2013. Next sunday 23rd December, is the WSAA Christmas match, fishing 2pm-7pm, weigh in by 8pm (prompt) members are reminded £10 is due in advance. Food and prize giving will be at the Fleece on Church Street, where everyone receives a prize (whether they caught a fish or not). High water 20.27 hrs 5.0 metre. Whitby Sea Anglers Association members met for the penultimate match of 2012, it being the season for celebrations and jubilation as Christmas came early for one, and as another declared ‘bar humbug’. High water was mid match, 20.27 hrs 5.0 metre, so 1½ hrs of both flood and of ebb. 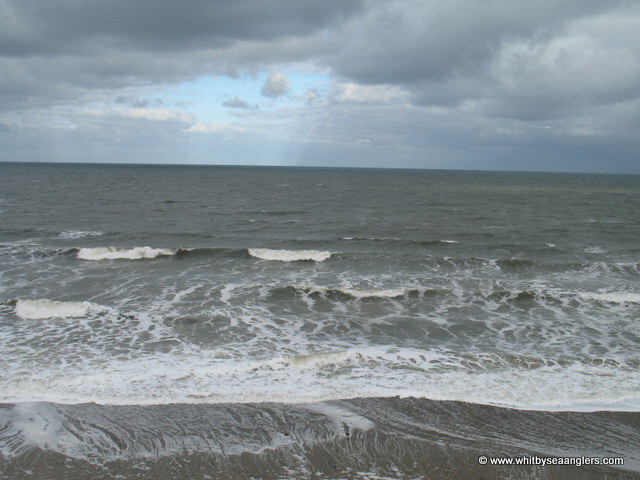 With an ever increasing, and surging south easterly swell and likewise a south easterly wind. Thankfully the forecasted rain held off. Plenty of colour in the water, expectations were high. I had forgotten my camera and with hindsight, finished fishing 10 mins early to return home for it, as conditions were ideal for a double figure cod or two. Glad I did! 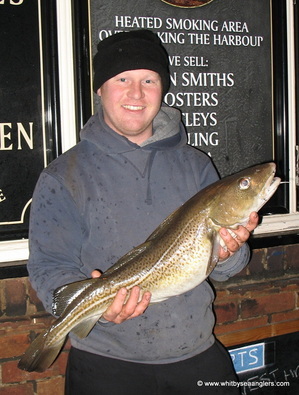 Christmas came early for ‘King Cod’, nee James Gilpin, as he apologised to all saying “sorry gentlemen but I just had to pull this baby out of the bag!” Sliding a very pale cod, of 11 lb 08 oz on the scales (photograph by Peter Horbury), then, adding a second for 13 lb 03 oz. This, his personal best, saying he had been lucky as he only had 3 hook traces in his rucksack, as he had left his rig wallet at home. James now tops both the Heaviest Bag of Fish and Heaviest Fish of the Month sweeps, with just the Christmas Match left for December. 19 members fished and 9 weighed in 29 fish for 54 lb 15 oz. In the Singles Knockout Final James Gilpin, again victorious, beat Scott Moore, 2 codling for 3 lb 05 oz. Paul Dryden, snapped off his shock leader while casting and following through hitting the railings, snapping his rod tip clean in two, bringing his evenings fishing to an abrupt end, bar humbug. Neil Inglis had 2 fish for 11 lb 12 oz, photographed here by Peter Horbury with his heaviest Fish 9 lb 14 oz. James Gilpin, nee 'King Cod' WSAA - 11 lb 08 oz. Neil Inglis, WSAA - 9 lb 14 oz. 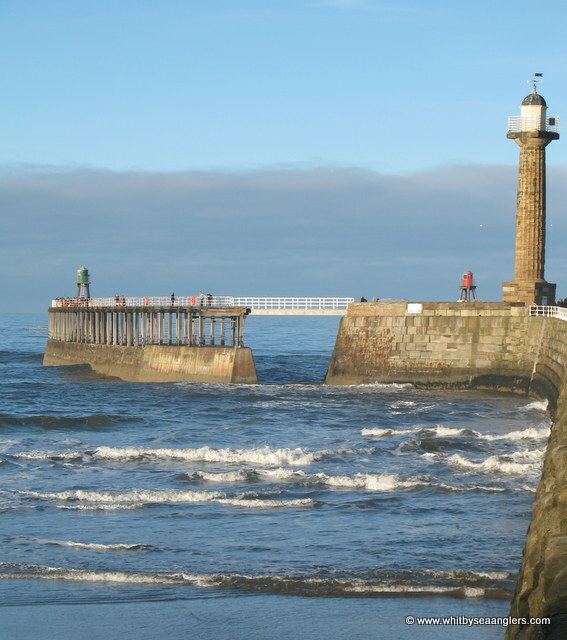 Sunday 23rd December, is the Whitby Sea Anglers Associations' Christmas match, fishing 2pm-7pm, weigh in by 8pm (prompt). Food and prize giving will be at the Fleece on Church Street, where everyone receives a prize (whether they caught a fish or not). Local respected angler and previous member of Whitby Sea Anglers, Brian Harland was also out and about fishing. He sent me a couple of photos of 2 of his fish, 10lb 14 oz and 7 lb 00 oz. He had 5 fish for 25 lb. Brian Harland, 10 lb 14 oz and 7 lb 00 oz. Photograph sent in by Brian Harland. Brian Harland, 10 lb 14 oz. Photograph sent in by Brian Harland. Whitby Sea Anglers Association members met for the last match of 2012 and half way through the season for their Christmas Match. Fished from 2pm – 7pm weigh in by 8pm, with 22 members taking part, where no one goes home without a prize or two. Conditions were far from favourable, with some long distance, but surging, south easterly swell and a howling south westerly wind. Plenty of colour in the water and thankfully no rain. 15 members weighed in an impressive 105 lb 00 oz, 32 fish, with some very good fish in the catch, which seems to be the general trend this season. The Christmas Match winner, with the Heaviest Bag of Fish, was Dave Hambley who received £25, 5 fish for 21 lb 06 oz. Dave also lost another good fish, believed to be lip hooked, in the swell. Fishing along side him was Paul Garbutt (non member this year), who had a cod believed to be over 11lb. 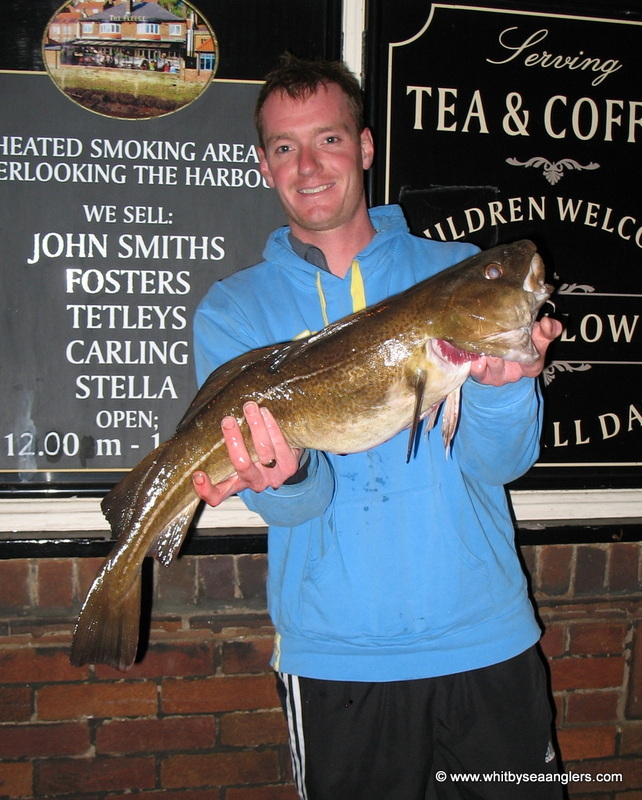 The Heaviest Fish went to 2nd place Matthew Garbutt, 10 lb 13 oz, part of a bag of 2 fish for 15 lb 13 oz, received £25. Jay Allison (Jnr), was 5th, with 2 fish for 8 lb 02 oz, with the best being 6 lb 06 oz. Out fishing his father, Rob Allison again, who was 10th with 1 fish for 4 lb 00 oz. Andrew Cass reported he lost 2 very good fish, the first could not be ‘lifted’ and literally straightened both hooks on his pennel rig. The second snapped his line as it caught the rocks when lifting. That concludes December with 226 fish for 393 lb 09 oz being caught by the members of Whitby Sea Anglers. 26 matches and 831 fish have been weighed in for 1,358 lb 00 oz. In the sweep for December the Heaviest Bag went to Dave Hambley 21 lb 06 oz, and the Heaviest Fish went to James Gilpin, nee King Cod, 11 lb 08 oz. Matthew Garbutt, Heaviest Fish winner - 10 lb 13 oz. Photograph by Peter Horbury. Jay Allison (Jnr) Junior winner with his best fish of 6 lb 06 oz, part of a 2 fish bag for 8 lb 02 oz. Photograph by Peter Horbury. Matthew Garbutt, William Atkinson, WSAA Chairman and Dave Hambley. Photograph by Peter Horbury. William Atkinson presenting, belatedly, Dave Hambley with the Christmas Match Trophy. Photograph by Peter Horbury. Sunday 30th December 2012 is the Ship Open. 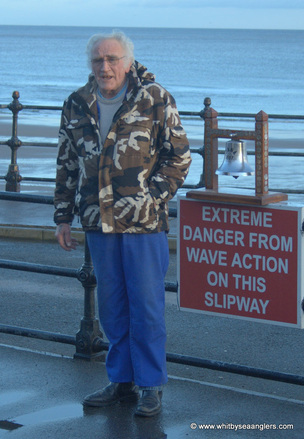 Whitby Sea Anglers Associations' season resumes on wednesday 2nd January 2013. In the Leader Board:- Dave Hambley’s bag of 21 lb 06 oz propels him from 6th place to 3rd in the leader board. 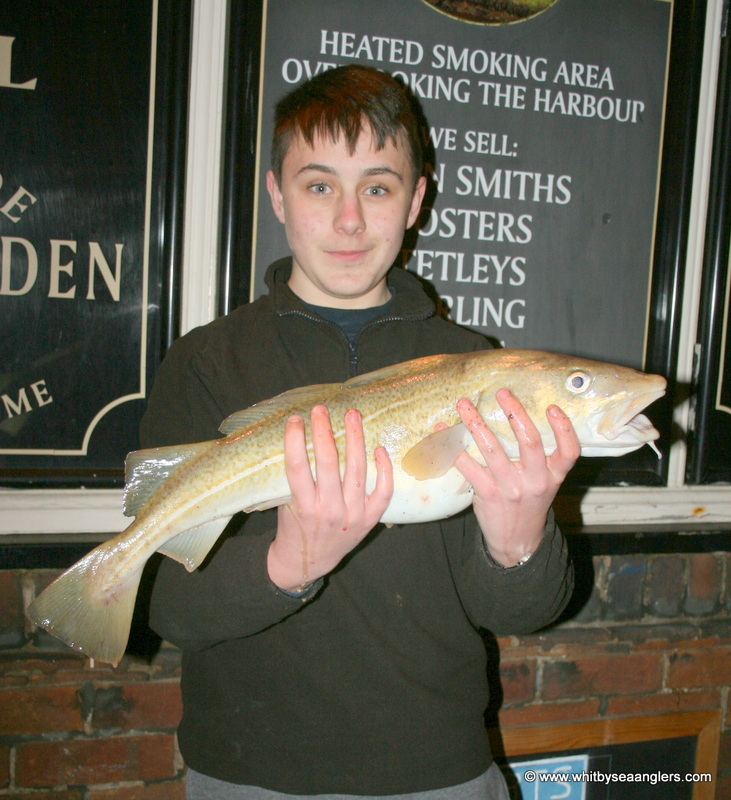 Junior winner was Ethan Britton with a single billet of 1 lb 11½ oz. High water 18.54 hrs 5.3 metre. 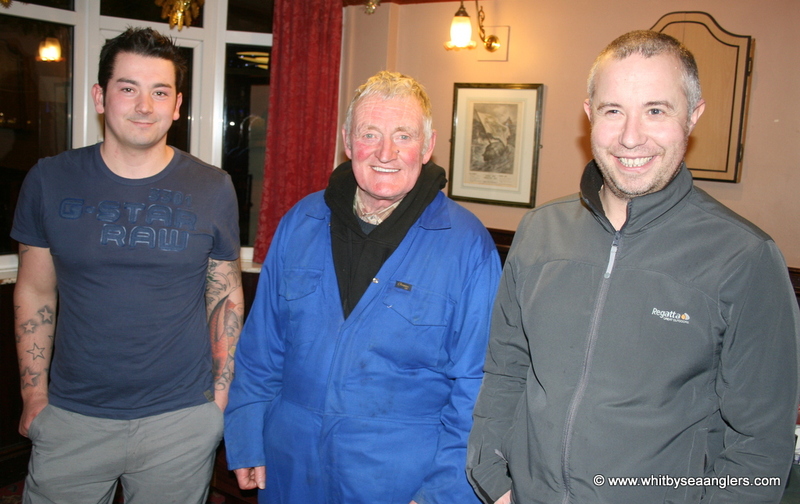 Whitby Sea Anglers Association members met for the first match of 2013, the second half of the 2012 – 2013 Season, after the short festive break on Wednesday night. With some long distance swell and plenty of colour in the water there was every chance of a codling or two on the beaches. ​However with an increasing west south west wind making fishing on exposed beaches uncomfortable, rod rests and fishing bags being blown over. 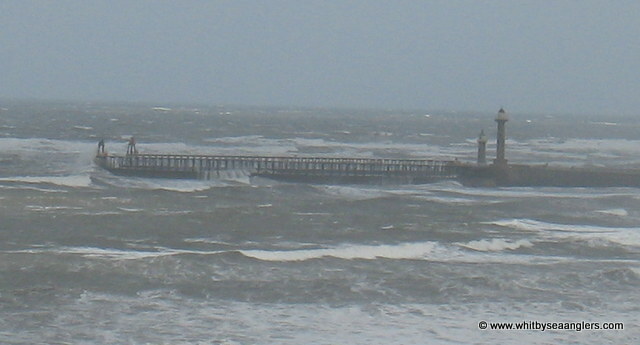 Fishing on the west pier was no better as the wind was in your face, making casting and standing upright difficult. With a good turn out of 17 members fishing, 10 members were at the scales with 29 fish for 17 lb 10 oz, a mix of whiting, flatties, a rockling but alas no codling. 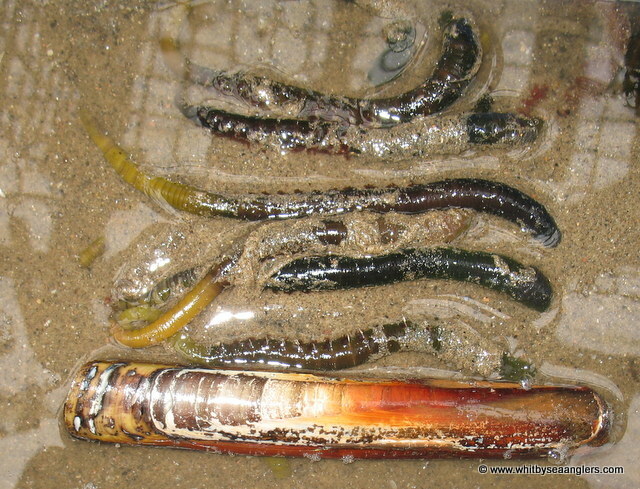 Whiting and flatties being caught on (frozen) black lug worm and small squid. The Doubles Knockout final was fished and won by Andrew Cass & James Moore with a combined weight of 6 lb 11 oz. Runners up were Matthew Garbutt & James Gilpin with a combined weight of 5 lb 06 oz. In other news:- Ship Inn Open supported by Whitby Sea Anglers Association. Well done to Dean Clews who won the Ship Inn Open on 30th December 2012 with a codling of 5 lb 12½ oz. Heaviest Bag was won by Grant Greenland with 4 fish for 11 lb 10½ oz. 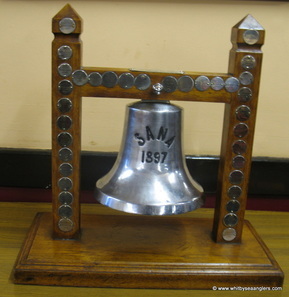 Members are reminded that the Inter Angling Club Tournament for the Bell Trophy takes place on Sunday 27th January 2013. In the Leader Board Matthew Garbutt maintains a 73 lb 14 oz lead over second place Neil Inglis, who in turn has a comfortable lead of 40 lb 04 oz over third place Dave Hambley. Sunday nights 4 hr match was a real disappointment for some as the mild weather continues. A flooding tide, flat calm, crystal clear water, plenty of cloud cover, made for a warm evening with a slight south westerly breeze. High water 22.37 hrs 4.7 metre. Sandsend beach was fishless for Whitby Sea Anglers Association members and the only fish I saw caught was by an angler from York. 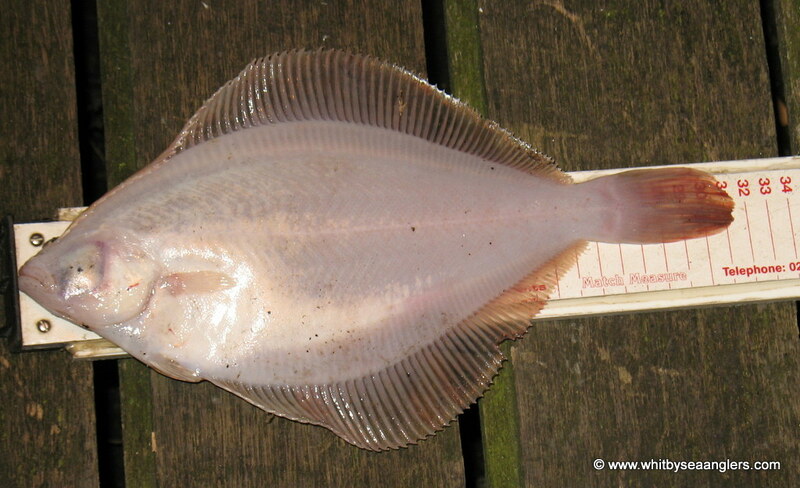 A good size flounder caught on prawn. Man of the match was Mick Beedle with 4 lesser spotted dog fish for 7 lb 08 oz. Rob Allison (photographed by Peter Horbury) caught this lesser spotted dog fish of 2 lb 10 oz which is 53.2% of the British record. However the theme of the night was Whitby Sea Anglers Association Club Records. 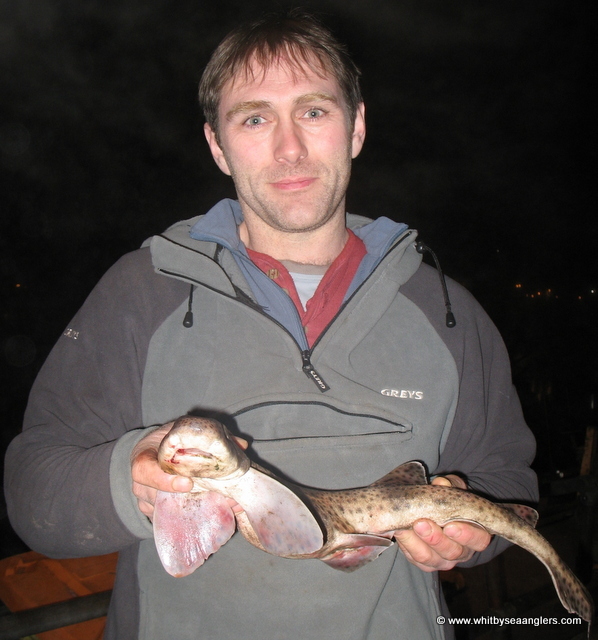 Rob Allison caught a lesser spotted dog fish of 2 lb 10 oz which is 53.2% of the British record. 14 members fished and 8 weighed in 41 fish for 32 lb 09 oz. Chairman William Atkinson belatedly presented Dave Hambley with the Christmas Match Trophy. 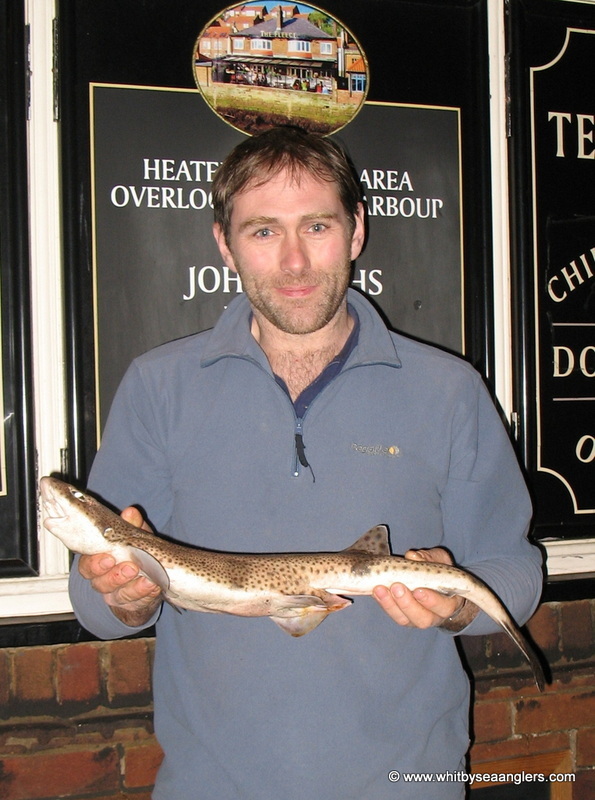 Rob Allison caught this lesser spotted dog fish of 2 lb 10 oz which is 53.2% of the British record. 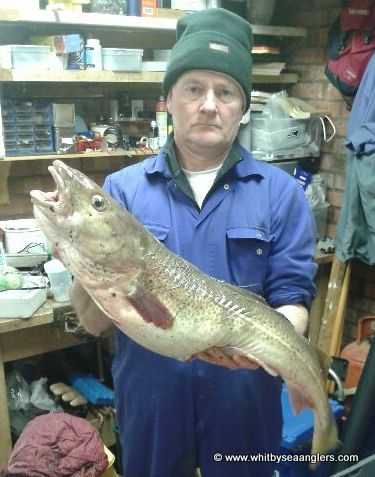 Dave Perrett caught this 32 cm, 10 oz Dab, which is 24.4% of the British record. Photograph by Peter Horbury. In the Leader Board Matthew Garbutt has a healthy lead of 79 lb 08 oz over second place Neil Inglis. Andrew Cass is on form and has moved up in to 7th place past Ben Laws. Low water 20.06 hrs 1.3 metre. 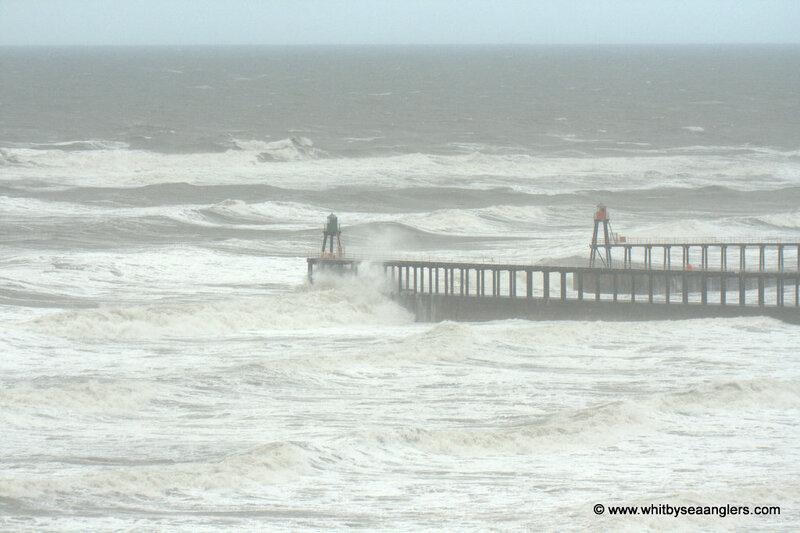 Members of Whitby Sea Anglers Association met for the Wednesday night 3 hr match in far from ideal conditions. The sea state, resembling the Mediterranean, tranquil, crystal clear and flat calm, which left members little option but to scratch on the beaches for flat fish, whiting and rockling or chance it and venture on to hard ground. Around 8pm the wind picked up from the NW and temperatures started to drop. At this time of year, fish move in to deeper water to spawn, so finding a codling would be a real bonus. Man of the match was Rob Allison who managed just that and once again found fish in these conditions with 3 fish for 12 lb 12 oz, the heaviest fish being 5 lb 05 oz. 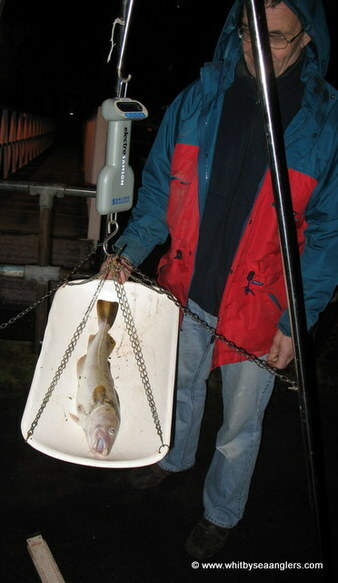 Both the bag and fish weight set the marker for others in the monthly sweeps. 14 members fished and only 7 were at the scales to weigh their mixed catch of 14 fish for 19 lb 07 oz, 3 members however missed the weigh in and could not weigh in as the weigh master had already called time. Mick Beedle had his evenings fishing ‘cut short’ as he managed to snap his rod, not once, but twice!! After Sunday 13th January members are reminded the Fleece shuts for a 6 week refit. Weigh in as usual in Fleece car park. Members have been asked to meet at 08.30 hrs at the Oasis Café, North Marine Drive, Scarborough. Fishing 10am – 2pm , weigh in 2pm – 3pm at Scarborough Rock Anglers Social Club. New entry fee is £3 per Team. £2 Team; 50p Aggregate weight and 50p Heaviest Single Fish sweeps. In the Leader Board, Rob Allison’s bag of 12 lb 12 oz sees him leapfrog Dave Hambley into 3rd place and just 27 lb behind Neil Inglis, in Rob’s current form 2nd place is achievable. High water 17.02 hrs 6.0 metre. Low water 23.28 hrs 0.4 metre. For some members of Whitby Sea Anglers Association it was a very long day, fishing the Amble Open from 8am to 1pm and then fishing the club match 6pm to 10pm. Fishing a fast ebbing tide, with a little close to shore sea swell, wind direction was debatable. Once away from the shelter of the land mass, a gentle, but bitter, westerly breeze was found, however on cliff marks a south easterly was reported. One thing was certain it was going to be a cold night, with snow forecast, which thankfully did not materialise. 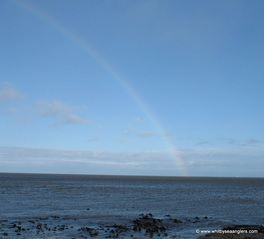 Water condition on the Sandsend beach was reported as crystal clear but on hard ground the water was thick with colour. With a very mixed selection of, codling, whiting, pouting, rockling and six lesser spotted dog fish weighed in, of the 18 members fishing 11 members were successful. 18 fish for 30 lb 09 oz. Dave Hambley was man of the match with 4 fish for 8 lb 14 oz, the heaviest codling of 5 lb 13 oz, sets the target for ‘Heaviest Fish of the Month competition’. Members are reminded the Fleece is now shut for a 6 week refit. Weigh in as usual in Fleece car park. Members have been asked to meet at 08.30 hrs at the Oasis Café, North Marine Drive, Scarborough. Fishing 10am – 2pm, weigh in 2pm – 3pm at Scarborough Rock Anglers Social Club. In the Leader Board, Dave Hambley’s bag of 8 lb 14 oz has moved him up the table into 3rd position. High water 19.08 hrs 5.5 metre. 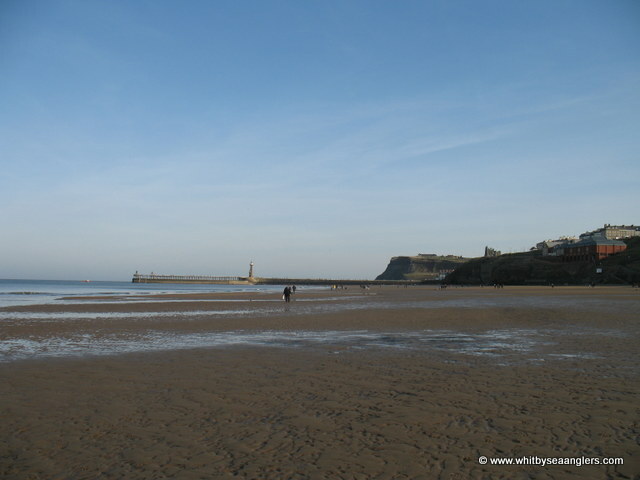 Members of Whitby Sea Anglers Association had many decisions to make before the 3 hr club match, stay close to town and fish the soft ground of the beaches or travel and fish the hard ground for chance of a better fish or two. Taking into account the current spell of cold weather I am sure many members had their minds made for them. Unlike Sunday the tide did not ebb as fast, there was a slight sea swell from the north east and a slight south east wind. It was a relatively dark night with some cloud cover. Water was well coloured and bites were slow and timid, fish were playing with the bait but once hooked they were of a good stamp. Temperatures during the day had not risen above -3 deg C and the breeze had a definite wind chill factor about it, as temperatures dropped further to - 6 deg C by the time members travelled to the weigh in. Bait was freezing as soon as presented on the hook. Members left their chosen marks in plenty of time and found the roads in good order thanks to North Yorkshire County Council Highways department. 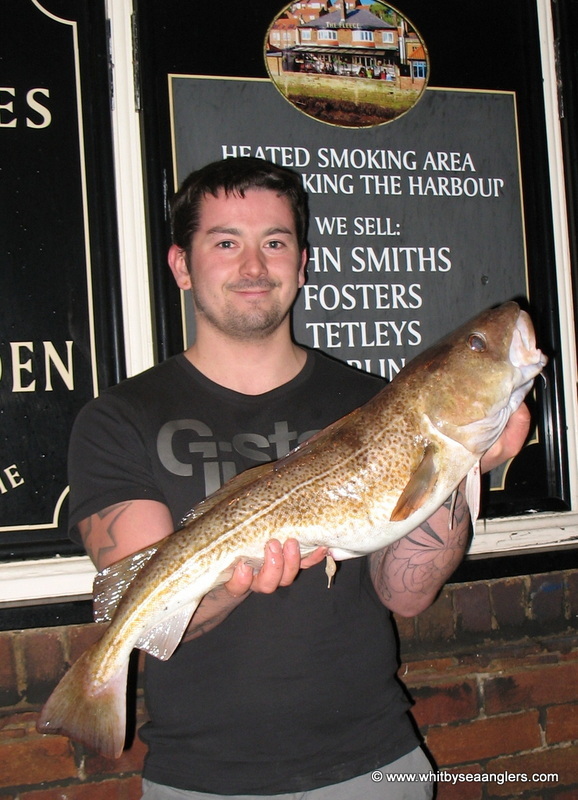 Once again Dave Hambley was man of the match with 1 codling for 5 lb 00 oz, the heaviest codling of the night. 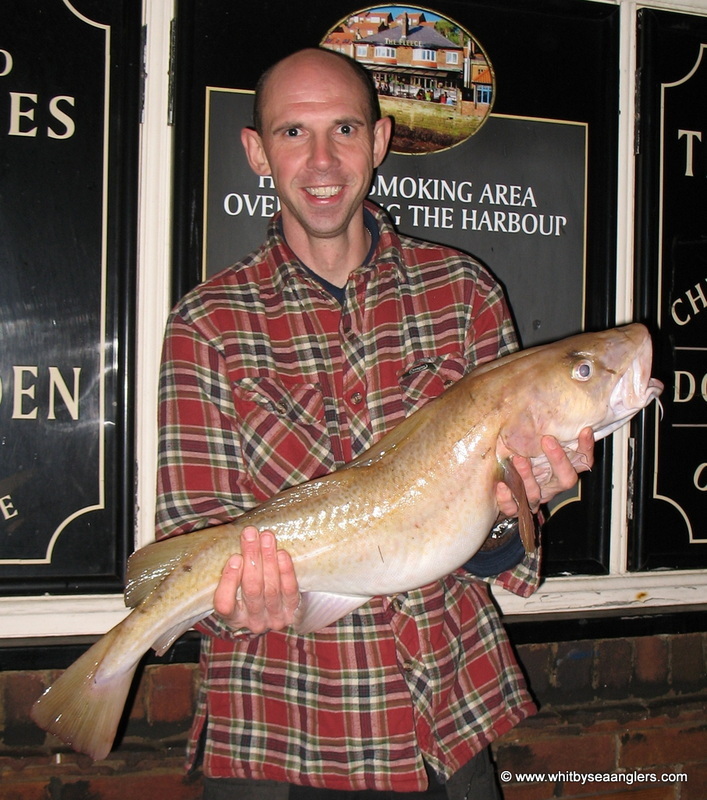 Peter Horbury also managed to find the only other codling weighed in, 4 lb 01 oz. 16 members fished and only 7 returned to the scales with 14 assorted fish, codling, billet, whiting, flat fish and rocklings for 17 lb 04 oz. The weigh in was, as usual, in the car park adjoining the Fleece, it was short and to the point, as members were keen to get into the warm. New entry fee is £3 per Team. £2 Team:- 50p Aggregate weight and 50p Heaviest Single Fish sweeps. High water 22.37 hrs 4.3 metre. 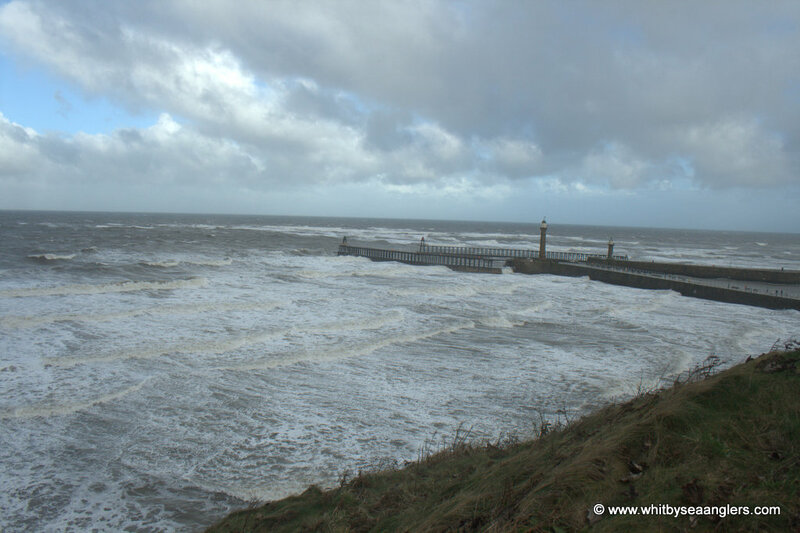 What a difference in the weather as members of Whitby Sea Anglers Association fished the 4 hour match in extreme conditions as the forecasted weather hit the coast line and predictions showed the weather would strengthen with 5 metre swells due by Monday morning. In general the temperature had risen above zero and the snow had started to melt but the severe easterly wind made wind chill a hazard. With a very strong and growing easterly sea running, finding somewhere to fish out of the wind was not going to be easy and made casting into a head / side wind difficult. 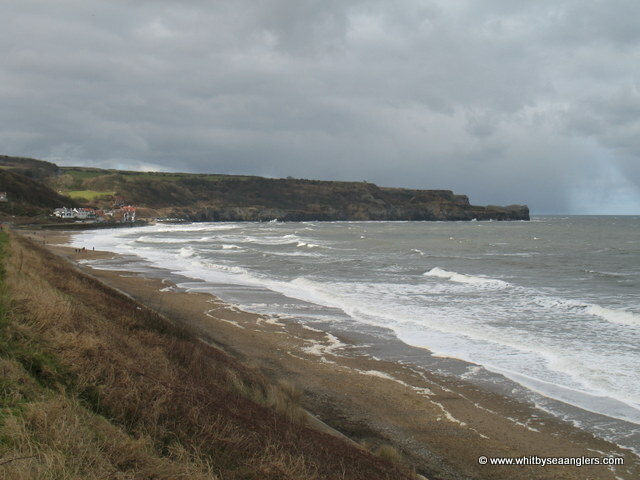 With such heavy seas, weed washing around in the surf is always going to be a potential hazard and at Runswick this was the case which meant constantly moving to avoid it. Anglers faced horizontal snow and harsh hail storms, which were uncomfortable but thankfully of short duration. Thankfully the predicted heavy snow fall did not materialize Bite detection in such severe wind conditions was difficult but that did not stop man of the match Matthew Garbutt from returning to the scales with the Heaviest Bag and the Heaviest Fish, for the January sweep competitions. 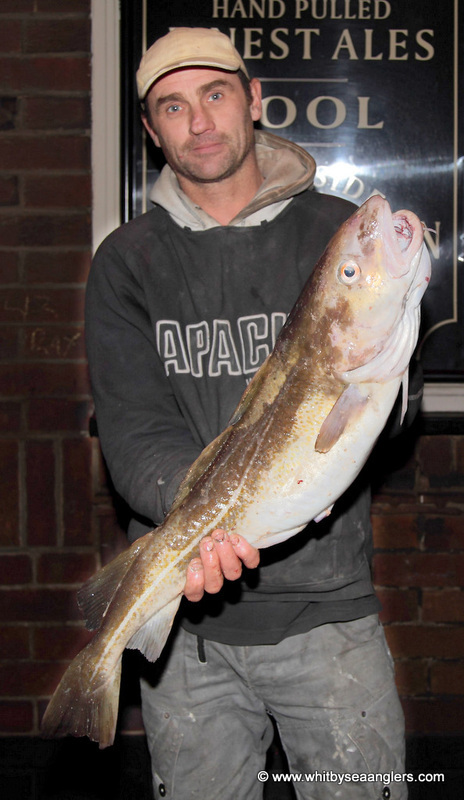 Matthew had 5 fresh run codling for 26 lb 02 oz, the heaviest fish weighing 7 lb 13½ oz, (photograph by Peter Horbury). Matthew reported he had lost another 3 good fish and all the fish he had caught had only been lip hooked. Matthew has now extended his lead over 2nd place Neil Inglis to 102 lb and in current form seems unstoppable. Thirteen club members fished and 7 weighed in 13 assorted fish for 47 lb 13 oz, the fish being predominantly fresh run codling of a good stamp. After the weigh many members made for home as the weather continued to strengthen. This concludes the 3 Sunday match results Whitby Sea Anglers Association members can submit to the Clubman series run by Sea Angler Magazine for the month of January. Matthew Garbutt extends his lead over nearest member Neil Inglis to 102 lb. Sea Scorpion (Myoxocephalus Scorpius). Photograph by Peter Horbury. Low water 19.55 hrs 2.1 metre. Whitby Sea Angler Association members fished the Wednesday night 3 hr match as the 5 metre easterly swells of Monday had been slowly dying back to a state where marks became fishable again, the easterly wind had also dropped. That was until the match started and the easterly wind picked up again and so did the sea state once the flood begun. Temperatures were above zero but anglers were pelted with hail storms of short duration which had been evident all day and continued throughout the match. The strengthening wind brought with it wind chill which made baiting up painful. Water clarity was different on many marks, with a wide range from crystal clear, through milky to thick with colour. Hence the weigh in was poor as 17 members fished and only 5 members weighed in 8 fish for 20 lb 05 oz. Ben Laws caught the heaviest fish of the match, a 4 lb 01 oz codling. 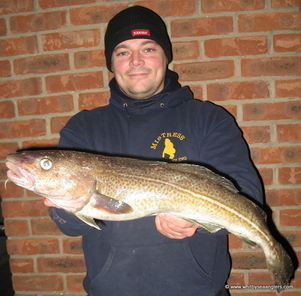 Scott Moore the heaviest bag, 2 codling for 6 lb 14 oz. Rob Allison caught a Sea Scorpion (Myoxocephalus Scorpius) which weighed in at 11 oz, this is 28.2% of British Record (photo). Once weighed in it was returned to the sea. There will be no night match on Sunday as members of Whitby Sea Anglers Association have been invited to compete for the Annual Inter Club Tournament, The Bell Trophy. 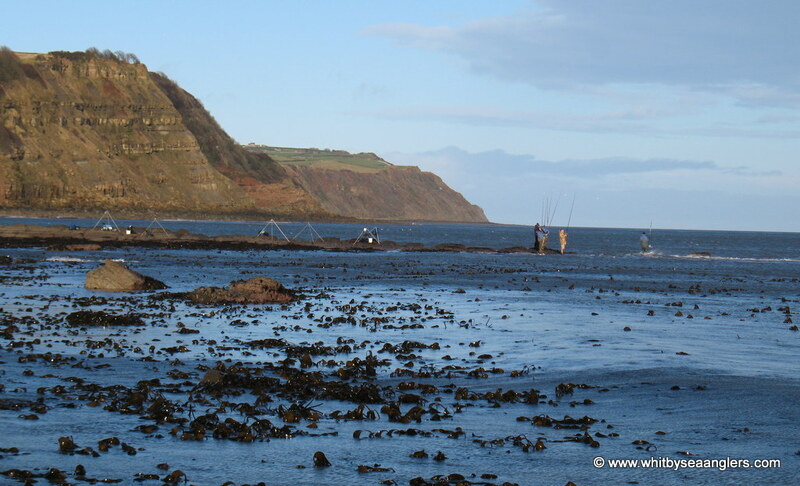 Organised by Scarborough Rock Anglers Society, nine local clubs will be fishing from 10am to 2pm. 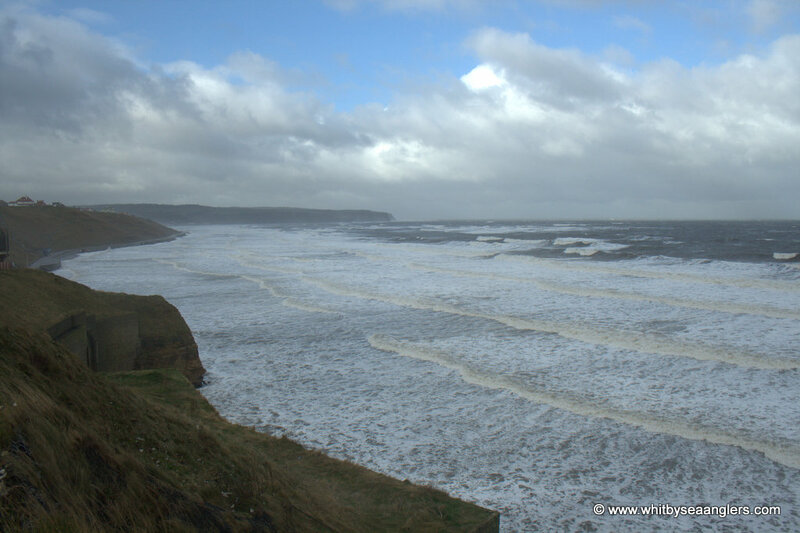 Low water 1039 hrs for Scarborough 1.4 metre. Whitby Sea Angler Association had been invited to compete for the Annual Inter Club Tournament, The Bell Trophy. 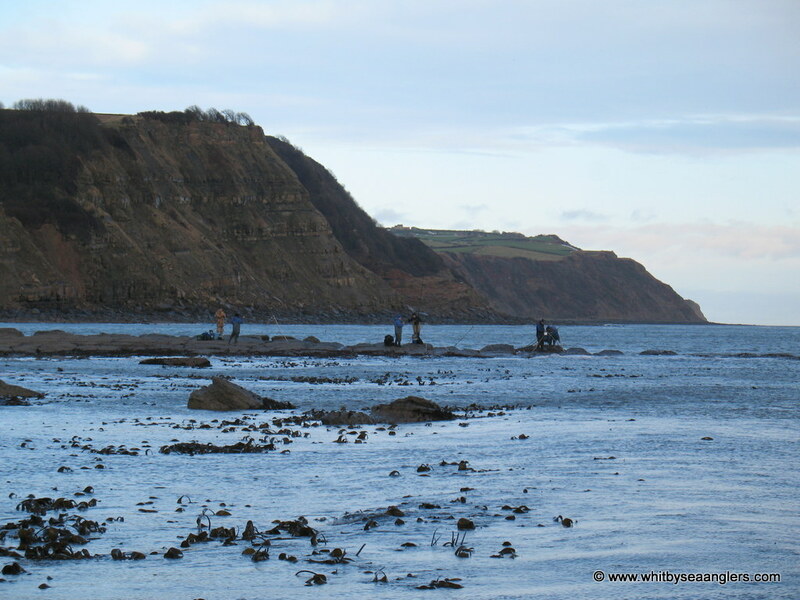 Organised by Scarborough Rock Anglers Society, nine local clubs were fishing from 10am to 2pm. Therefore there was no WSAA night match. Eighty five local anglers met up on Marine drive Scarborough at 0830 hrs to register for the Annual Inter Club Fishing Tournament. George Dunn, Secretary of Scarborough Rock Anglers Society presided over the registration (photo). After a short reminder of the rules and fish sizes, anglers departed to their chosen marks at 0905 hrs. 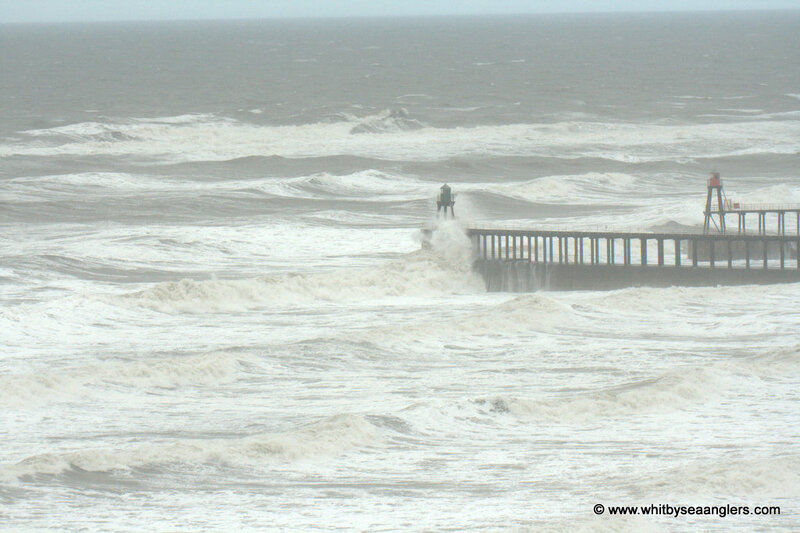 Low water was at 1039 hrs and once the flood took a hold, the swell increased. There was plenty of colour in the water and anglers were hopeful of fish or two, in amongst the heavy kelp beds. 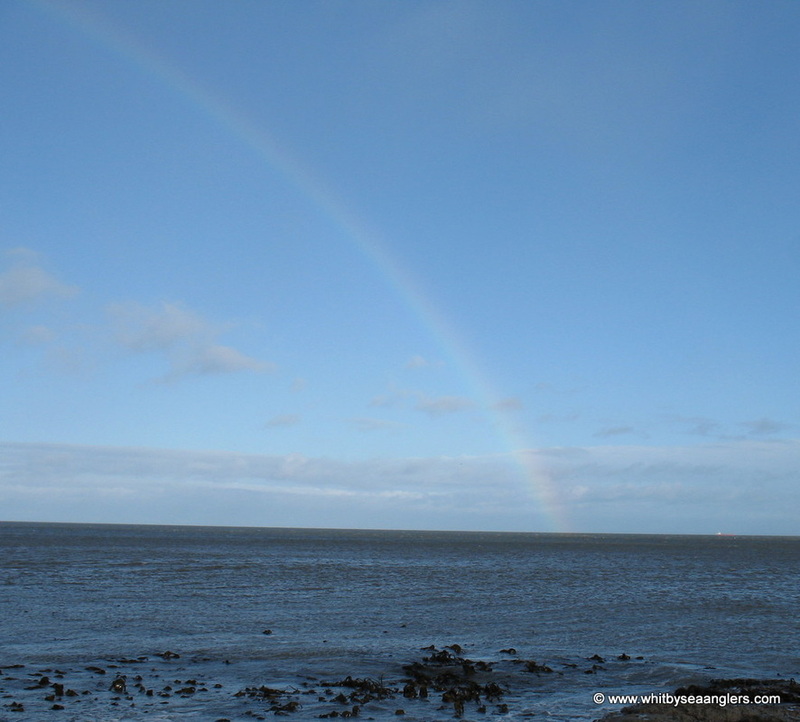 There was a strong and as it happened, strengthening south westerly wind, with intermittent rain showers, followed by bright sunshine and a few rainbows to marvel at with no pot of gold, as fish were scarce. Less than a quarter of the anglers taking part successfully weighed in. Fourteen members of Whitby Sea Anglers Association travelled to Scarborough to represent their club with 2 teams of 7 anglers. In the past Whitby Sea Anglers Association have won the Bell Trophy four times, in 1986, 1997, 2006 and 2010. Unfortunately this year only one member succeeded in catching a fish, a codling of 1 lb 14 oz 14 drams, giving Whitby B an average of 03 oz 14 drams. 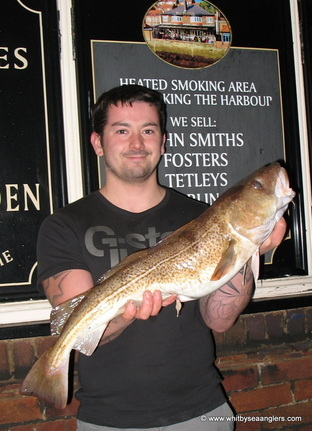 Matthew Garbutt won both WSAA sweeps, £49 for Heaviest Fish and £49 for Heaviest Bag of Fish. 10 lb 13 oz 12 drams. 7 lb 08 oz 06 drams. 8 lb 07 oz 00 drams. 8 lb 14 oz 04 drams. 1 lb 14 oz 14 drams. 1 lb 11 oz 04 drams. 0 lb 15 oz 10 drams. 0 lb 09 oz 11 drams. 1 lb 05 oz 11 drams. 0 lb 15 oz 01 drams. 0 lb 15 oz 00 drams. 0 lb 14 oz 01 drams. 0 lb 03 oz 14 drams. 0 lb 02 oz 08 drams. 0 lb 01 oz 05 drams. 0 lb 01 oz 01 drams. Sweep for the Heaviest Bag and Heaviest Fish went to Keith Thompson 5 lb 11 oz. Junior winner M Colling 1 lb 01 oz 02 drams. Lady winner K Niblett 0 lb 04 oz 02 drams. 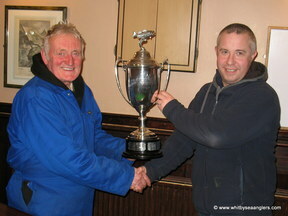 Keith Thompson also won the team sweeps for both Scarborough Rock Anglers and South Cliff. L Ingle won the sweeps for Scalby Mills 3 lb 09 oz 10 drams. Wednesday 30th January 2013. 35 of 52. High water 1756 hrs 5.7 metre. Low water 0021 hrs 1.4 metre. Whitby Sea Anglers fished Wednesday’s 3 hr match in very windy conditions as a west, south west wind prevailed and did not ease all night. Members sort a sheltered mark but with little colour in the water and with a little close to shore swell, fishing and chasing down an all ebb match on a big tide did not have real potential for a fish or two, unless the beaches still had the whiting around. It was a dark, clear night until 2100 hrs when a bright red moon rose above the horizon to the east and progressively got brighter and the bites got fewer. Whiting were taking a cocktail of mackerel strip and lug worm. Man of the match was James Gilpin with 11 whiting and 4 flat fish for 9 lb 12 oz. Whiting are of a good stamp, around 1 lb and Andrew Cass caught one of 1 lb 04 oz. 9 members were at the scales with 56 fish for 51 lb 05 oz. Neil Inglis and Dave Perrett surprised everyone by weighing in 4 codling between them. Dave’s fish of 4 lb 08 oz, the heaviest fish of the match, was caught on his second cast and was the only bite all evening. Neil reported the conditions on the end of the west pier were unpleasant as the wind was directly in the face and made casting and bite detection difficult. That concludes January’s nine matches and Matthew Garbutt won both sweeps, Heaviest Fish 7 lb 13 oz and Heaviest Bag 26 lb 02 oz, both on Sunday 20th January 2013. January:- In total members weighed in 194 fish for 238 lb 13 oz. Filey have announced the following Open dates. Fords Open 23rd June 2013 fishing 9am - 2pm weigh in 3 pm. 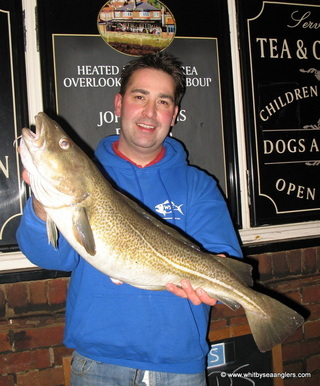 Filey John Smith Open 3rd November 2013, Heaviest Fish Match - fishing 9am to 2pm, weigh in 3pm. 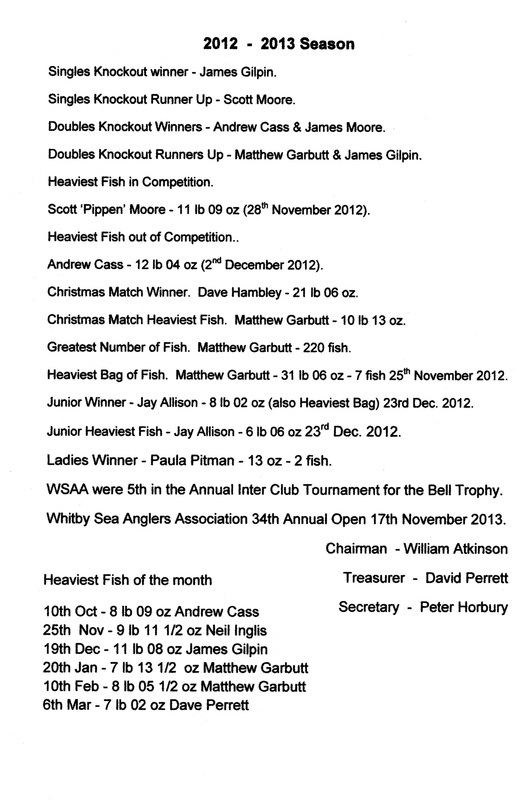 Whitby Sea Anglers Associations 34th Annual Open will therefore be on 17th November 2013. WSAA Annual presentation night will be on Saturday 20th April 2013 - 7.45pm at The Stables. Could members please start to bring in their trophies for engraving. Sunday 3rd February 2013. 36 of 52. High water 20.57 hrs 4.9 metre. Whitby Sea Anglers Association’s Sunday 4 hr match was fished over high tide, the last 3 hours of flood and an hour of ebb. Thankfully the gale force west, south west winds of the previous days had died down, with some northerly sea swell, although surging, was at times, too heavy for the beaches. The wind was slowly moving round to the west, north west and was not strong enough to hamper casting. A couple of light rain showers did not dampen spirits as there was every chance of a bag of codling. 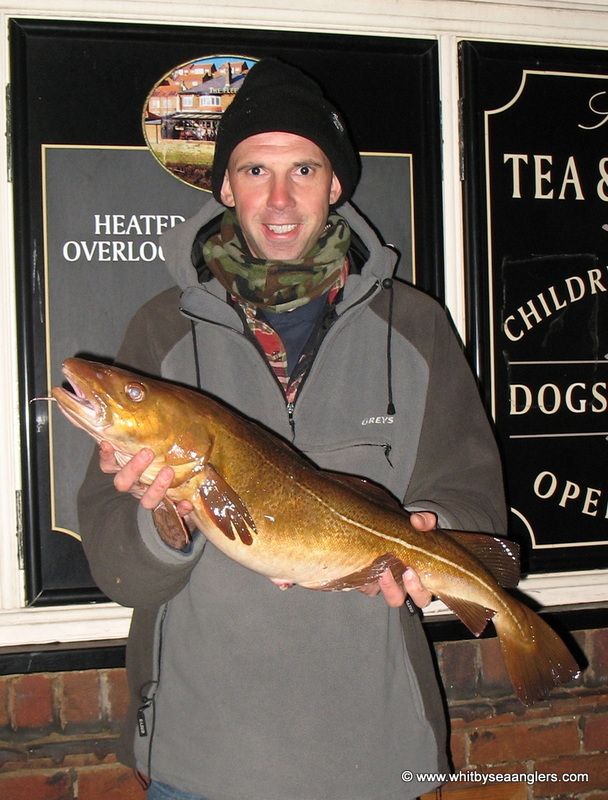 The first match for February and all was to fish for in the WSAA monthly sweeps, saw Dave Perrett return to form with his second win of the season, with his ‘heaviest bag’ of 4 codling to date. Eleven members were at the scales with an assortment of 21 fish for 54 lb 13 oz, predominantly codling. Dave Perrett, man of the match, with both the ‘Heaviest Bag’ (14 lb) and ‘Heaviest Fish’ (5 lb 06½ oz) set the targets for the February sweeps. Malcolm Pitman finally broke his duck and landed 2 identical white codling for 9 lb 02 oz for third place. Malcolm told me he hooked his first fish on a size 1 hook. He was unable to 'lift' the fish up from his vantage point on the 'rock armour', on this hook so had to climb down to the waters edge and lift it by the gills. Once landed, changed his hook trace to a bigger, stronger hook and caught his second fish. Scott Moore caught a pouting (Trisopterus luscus), although not a club record, was still an impressive 1 lb 02 oz, 24.7% of BR. The forecast for Wednesday nights match is ominous with 9 ft to 14 ft swells predicted, 30 mph north, north westerly wind winds. With today's papers also predicting snow and temps of - 4 deg C.
Wednesday 6th February 2013. 37 of 52. Low water 18.44 hrs 1.8 metre. 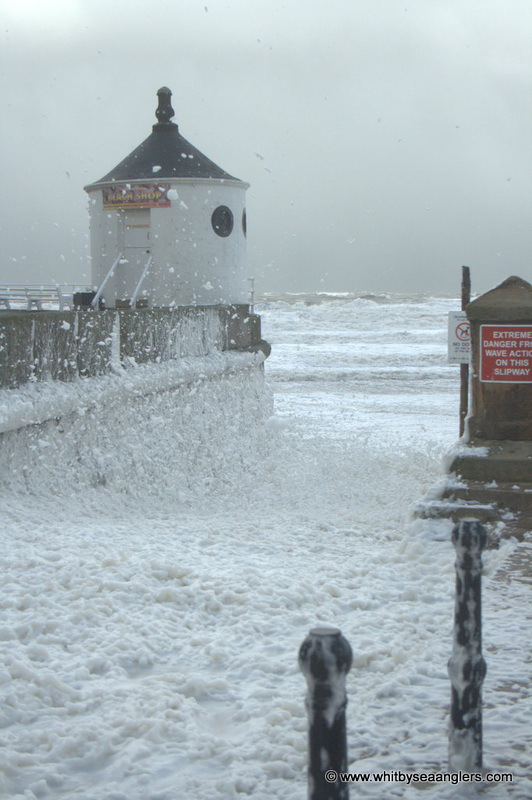 A biting wind from Russia, nicknamed the “Beast from the East” struck the north east coast as predicted by the Met Office, as members of Whitby Sea Anglers Association fished the 3 hr match in the most inclement conditions. Trying to find a fishable mark for the all flood match and sheltered, was not going to be easy as the north by north westerly gales whipped up a strong and powerful northerly sea swell. The ‘Beast from the East’ threw everything from torrential freezing rain, sleet and skin piecing hale, 18 members and many pleasure anglers fished in search of a codling or two. 9 lb 10 oz, despite the conditions, to win his first match this season taking a well earned ‘man of the match’. Catching the smaller of his two fish on his first cast and then his biggest fish on his last cast, a fine codling of 5 lb 02 oz, left his fishing mark in plenty of time to make the weigh in. 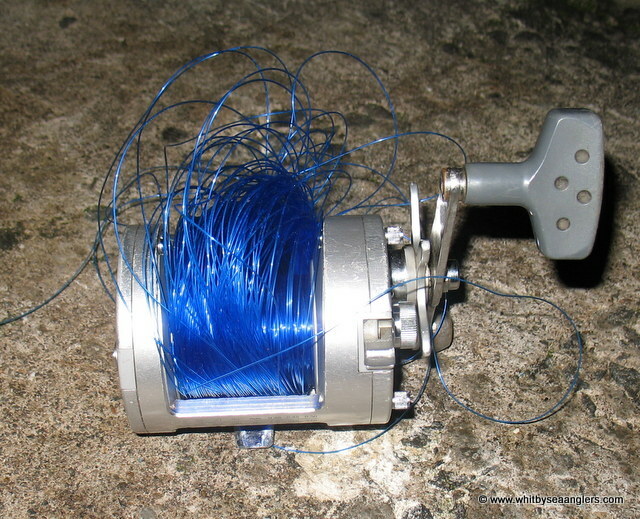 Jamsy reported he caught both his fish on a long flowing trace, a single 6/0 hook, baited with a cocktail of squid and lugworm. The largest, once landed, coughed up a codling, when gutted later, Jamsy said it had been feeding on two more codling and a billet, yet still had room for his bait. Neil Inglis reported losing a good fish, which straightened out his pennel rig hooks as he attempted to lift the fish. Surprisingly there was little weed washing around in the surf and a good 7 oz grip lead was a must as the swell was surging on the flood. 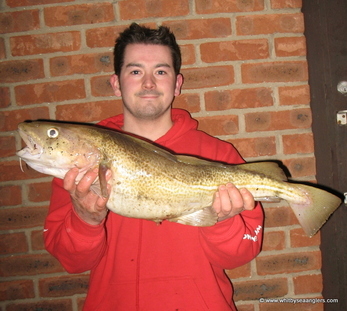 6 members were at the scales with 11 codling for 29 lb 02 oz. Scott ‘Pippen’ Moore has moved three places up the leader board and now has his sights on 8th place Ben Laws, only 4 lb 10 oz ahead. Photographs by Peter Horbury - Open larger image when clicked. High water at lunch time wednesday 6th February, (thankfully it is a small tide 4.6 m), bitterly cold, hail storms and exceptionally high winds as the biting wind from Russia, nicknamed the "Beast from the East" hits the northeast coast. Sunday 10th February 2013. 38 of 52. Low water 22.28 hrs 0.5 metre. Matthew ‘cleans up’ litter ally as Neil slips! Fifteen members of Whitby Sea Anglers Association fished the 4 hour all ebbing tide in very arduous conditions as the cold snap continues. With a strengthening south easterly wind bringing cold air and rain showers, with the threat of snow, fishing was not going to be easy or pleasant. Close to shore north easterly swell with plenty of colour which one member got too close to when he slipped on bladder rack, falling headlong into the icy water whilst casting in shallow water. Matthew Garbutt was man of the match but soon realised he’d forgotten his fish bag. Close by, on the high tide mark, was a carrier bag which saved the day to carry his double figure bag of 6 fish for 22 lb 11 oz back to the weigh in. 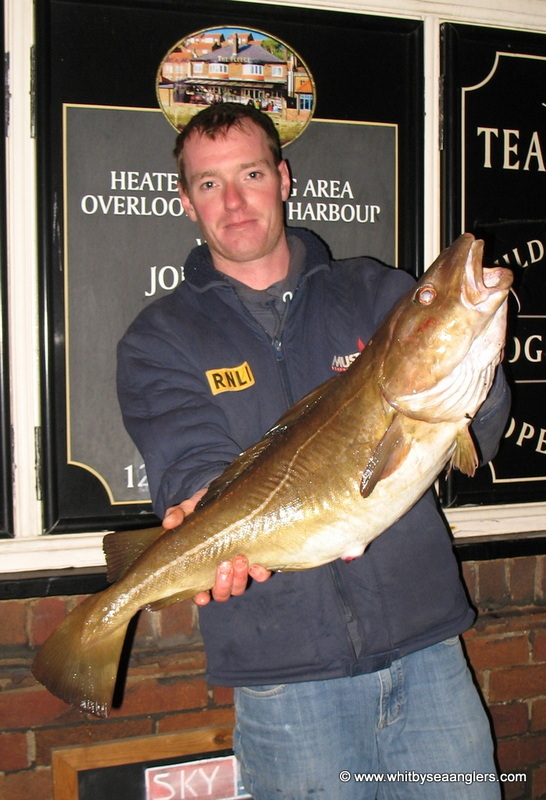 Matthew, photographed here by Peter Horbury with his heaviest Fish 8 lb 05½ oz. 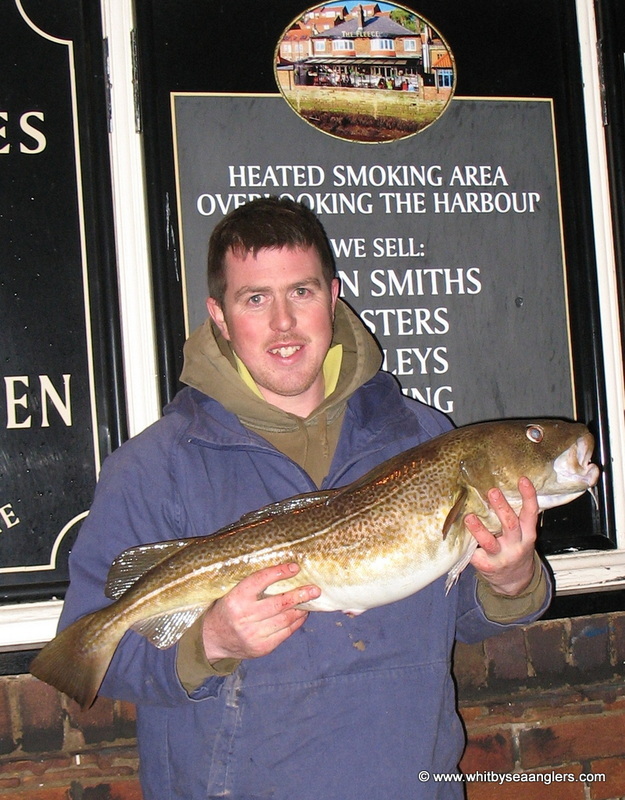 Matthew’s catch has secured the ‘Heaviest Fish’ and ‘Heaviest Bag’ sweeps to date for February. Matthew reported the fish were not taking peeler crab baits, instead preferring fresh black lug worm with the gentlest of bites. 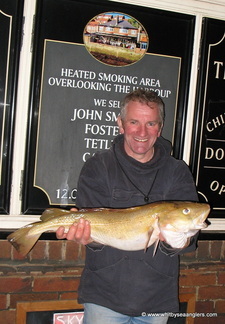 Rob Allison also had a double figure bag of 5 codling for 21 lb 08 oz. All codling caught in the match were fat bellied and heavy with kelk. Bernard Vasey caught his first fish of the season but also had an eventful night, casting into a head wind caused more than one ‘birds nest’ but once unraveled he pulled in a fine codling of 3 lb 15 oz, part of his bag of two for 5 lb 15 oz. Scott ‘Pippen’ Moore has achieved his last match goal and has taken 8th place from Ben Laws, out fishing him at the same mark. Rob Allison’s bag of 21 lb 08 oz has propelled him into 3rd place, passing Dave Hambley in the Leader Board. With more cold weather predicted with the threat of snow for Wednesday. 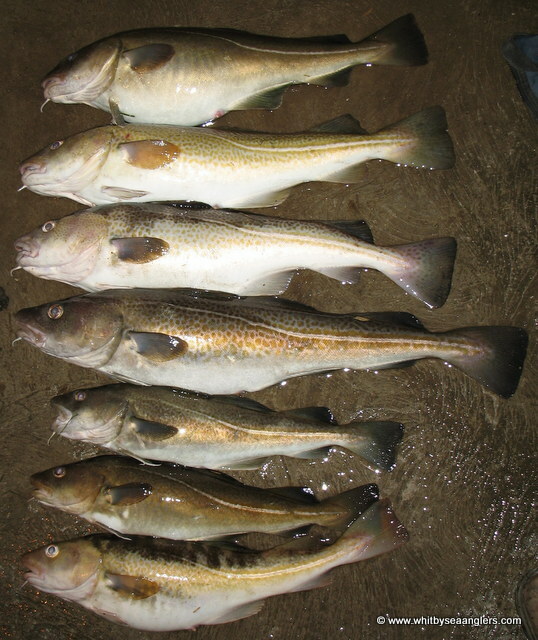 Eight members were at the scales with 21 fish, 18 codling, 2 rockling and 1 whiting for 72 lb 06 oz. Matthew has now extended his lead to 129 lb 13 oz over second place Neil Inglis. Wednesday 13th February 2013. 39 of 52. Low water 00.25 hrs 0.8 metre. 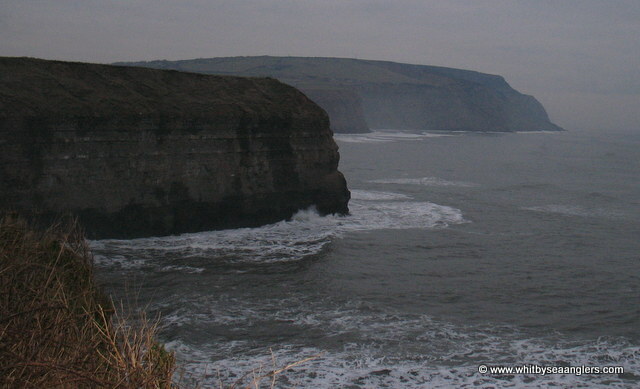 612 web site views (Wed 13th Feb) - many thanks for supporting Whitby Sea Anglers Association. After only 120 days for the new site, web site views stand at 32,478. Members of Whitby Sea Anglers Association ‘did’ fish the 3 hour match in extreme conditions as the forecasted weather hit the north east coast. With little close to shore swell and little colour in the water, finding a sheltered mark was not going to be easy given the road and weather conditions. The south easterly wind had been growing all day and the snow turned from a fine dust to heavy flakes which soon had motorists creeping gingerly through town as the snow began to lay and drift in open exposed locations. Reading the Whitby Gazettes updates on the social media sites, Facebook and Twitter, the Scarborough road was blocked at Pond Hill and the moor road was no better. The decision to stay local left members few options with not wanting to travel further afield, either the west pier or Sandsend beach, fishing for whiting. 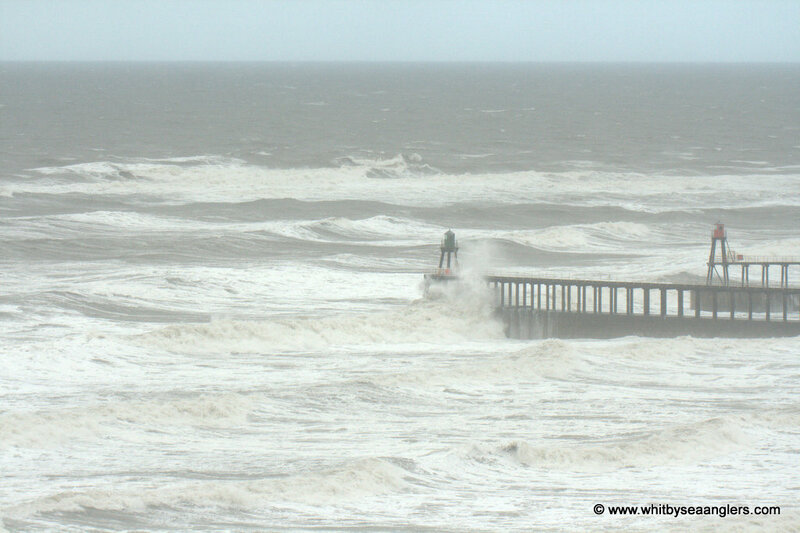 Those that choose the pier reported conditions as ‘wild’ but fish were caught, one described it as like being in a tumble dryer, constantly being thrown about. 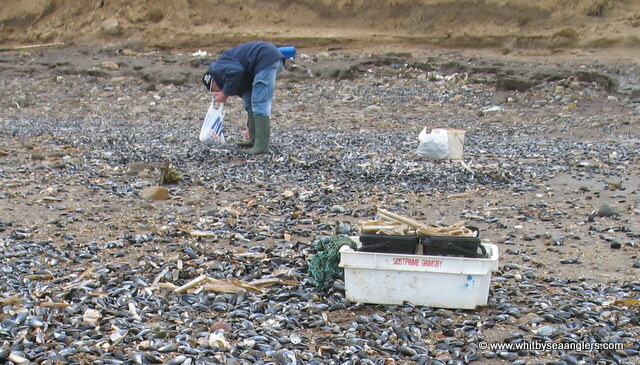 Once the ebb tide took a hold it soon ripped away and anglers were moving their kit 30 yards every 20 minutes. 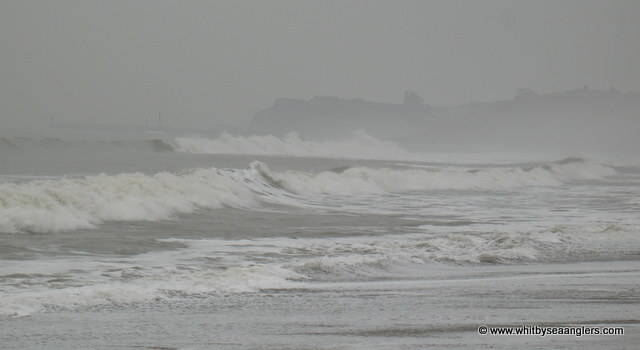 The further away from what little shelter the coast line gave, anglers were blasted with sand, hail, rain and sleet. Bite detection in such windy and cold conditions was hard, and at times it was necessary to hold the tip of the rod under the water. 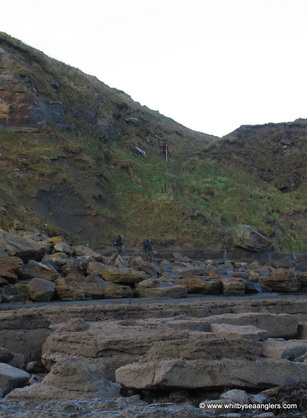 Once the tide had ebbed past the steep beach shelf and levelled off, anglers reported that the sand was softer than they felt comfortable with and until the sea drained away further it did not firm up. Catches, as expected were low and only 5 members were at the scales with 20 whiting for 17 lb 04 oz. The heaviest whiting was 1 lb 05 oz, caught by Neil Inglis on white rag worm. Dave Hambley was man of the match with 7 whiting for 6 lb 02 oz. Matthew Garbutt has now caught 200 fish. 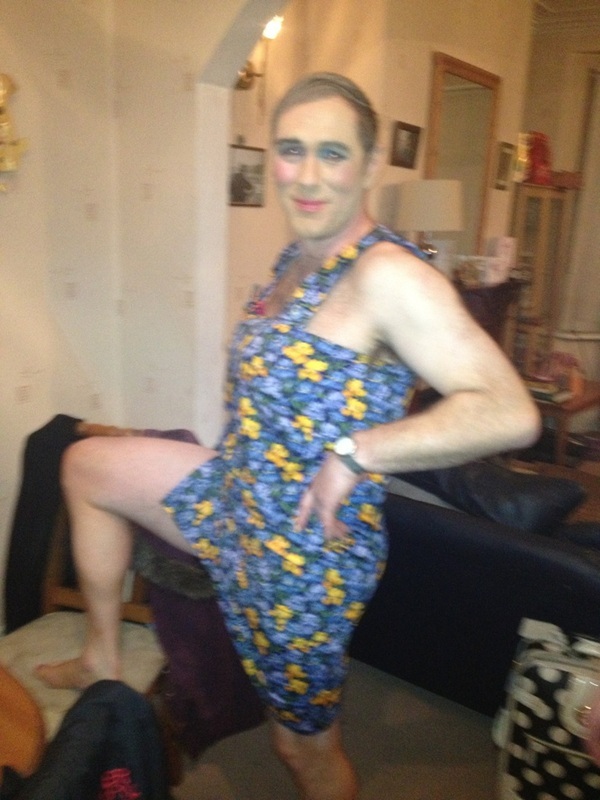 Sunday 17th February 2013. 40 of 52. For those who are currently engrossed in the android anagram game, 'Four Pictures', here is my version to amuse you. It is 'one picture' and all the 'words' are there as well, but which one is spelt incorrectly? 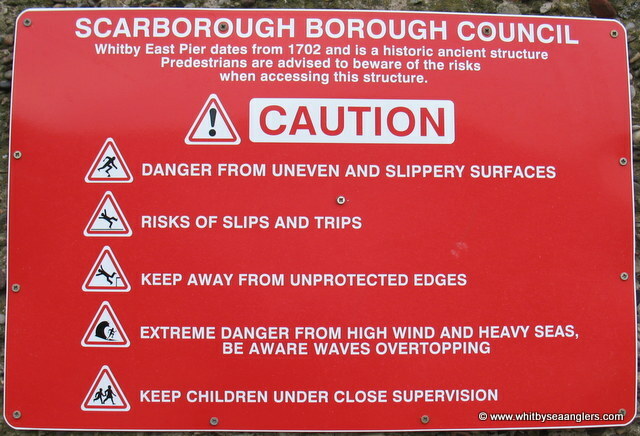 Courtesy of Scarborough Borough Council's sign on the 1st wall on the east pier and the sea state on Monday morning. High water 20.42 4.5 metre. Members of Whitby Sea Anglers Association had some decisions to make as Sunday was a bright sunny day, clear skies and flat calm clear sea conditions. With 1025mm of mercury on the barometer, in was neither low nor high pressure. It was going to be a slow cold night for the 19 members fishing. For those that elected to travel further afield had mixed pickings but all agreed it was a very cold night as the south easterly wind picked up strength and moved further to the south. Talk was of the recent meteor showers but no one reported seeing anything in the clear skies. For only the fourth time this season Matthew Garbutt did not weigh in and reported only one bite all night. Ben Laws has recouped some weight he lost to Scott ‘Pippen’ Moore and only 1 lb 01 oz separates them as they tussle for 8th & 9th. 16 lb 12 oz behind Neil Inglis, as we move into the last 12 matches of the season and no one should be complacent. 9 members were at the scales with a mixed selection of 25 fish for 20 lb 03 oz, whitings, lesser spotted dog fish, a rockling and a dab, but no codling. 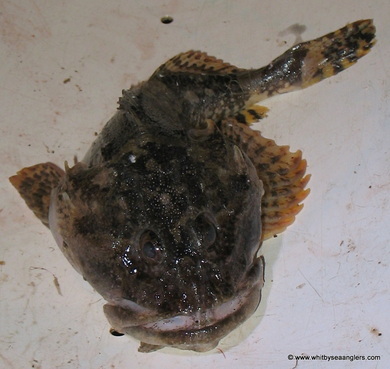 Neil Inglis reported catching 11 undersized codling (less than 35cms) which were all returned. Despite the calm conditions there were a lot of pleasure anglers out and for those inquiring about joining the club further details can be found on our web site as new members are always welcome. Wednesday 20th February 2013. 41 of 52. Low water 18.11 hrs 2.4 metre. The predicted 4 ft easterly swells did not materialise as members of Whitby Sea Anglers Association prepared for the 3 hr evening match. With plenty of colour in the water, the day time temperature was dropping, as the south easterly wind slowly strengthened and by 1630 hrs it was only 3 deg C.
With 1033 mm of Hg (mercury) on the barometer, the tide ebbed further than the charted 2.4 metre and was even slower flooding back, but with the swell increasing as the water depth increased there was always chance of a fish. By 2030 hrs the wind had increased further and the wind chill temperature was dropping fast. Bites were none existent and Rob Allison sort shelter in the comfort of some rocks. 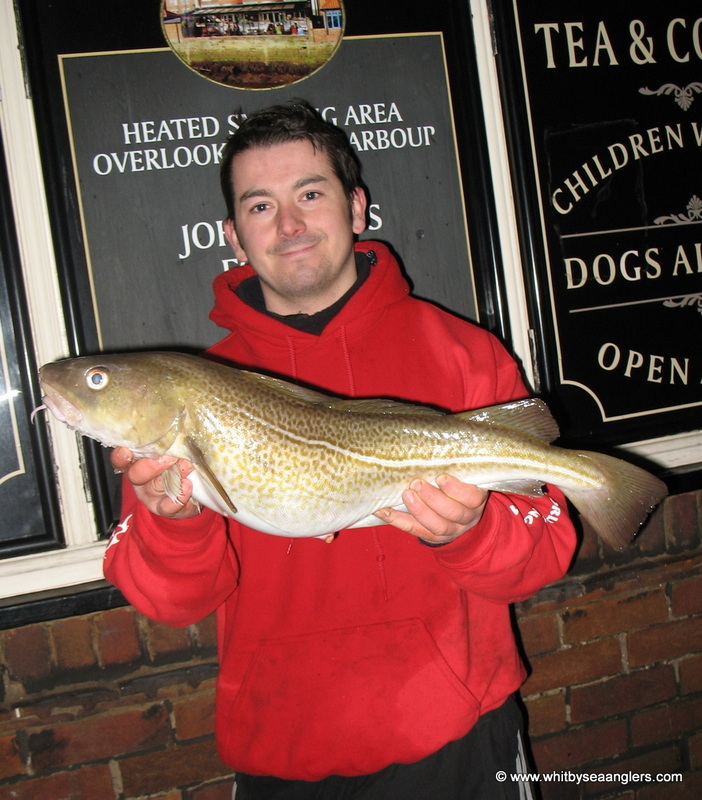 Admitting he had nodded off and awoke to a nodding rod, he soon landed the best fish of the night a 5 lb 04 oz codling. Peter Horbury struck into a persistent slow bite and was hopeful of a weigh in, only for the line to go light as whatever had been hooked had dropped off on the slow retrieve. Once his end tackle was recovered a 4” lobster claw was found to be cleanly hooked. Only 6 of the 16 anglers fishing were at the scales with 7 fish for 14 lb 05 oz, the second smallest weigh-in this season to date, 12 lb 06 oz was recorded on 18th November 2012. Once weighed, a fat bellied codling was gutted, to determine what the fish are feeding on at this time of year. 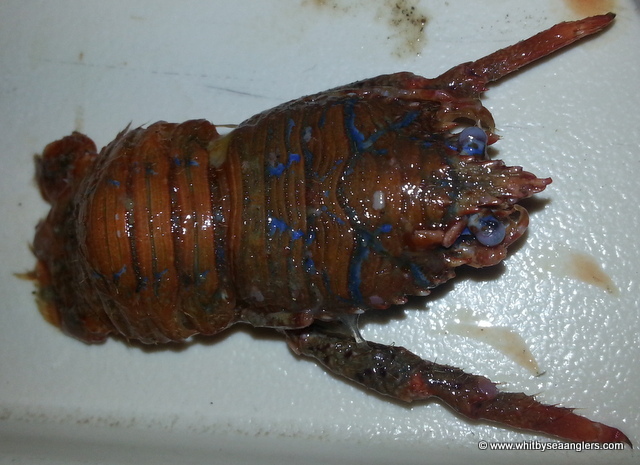 Interestingly a ‘squat lobster’ and shore crabs were found inside. 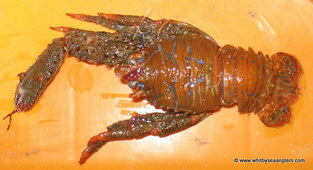 Picture of ‘squat lobster’. Now that's a 'birds nest'! 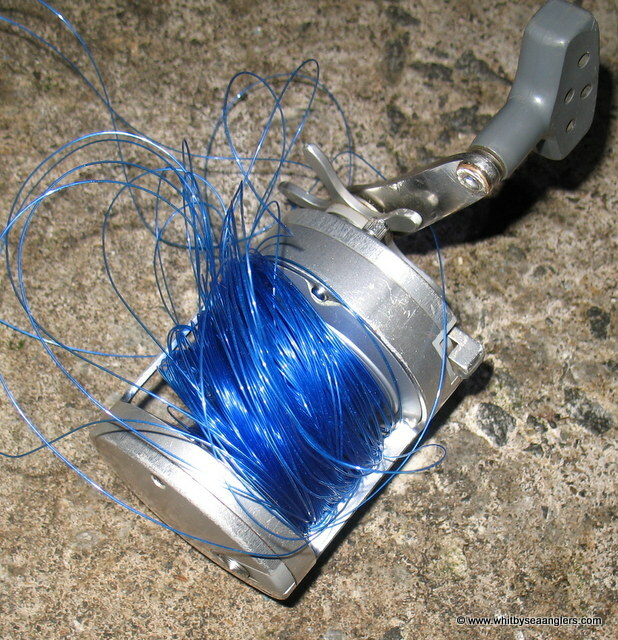 Everyone's worst nightmare when casting in windy conditions. Sunday 24th February 2013. 42 of 52. Low water 21.36 hrs 1.1 metre. 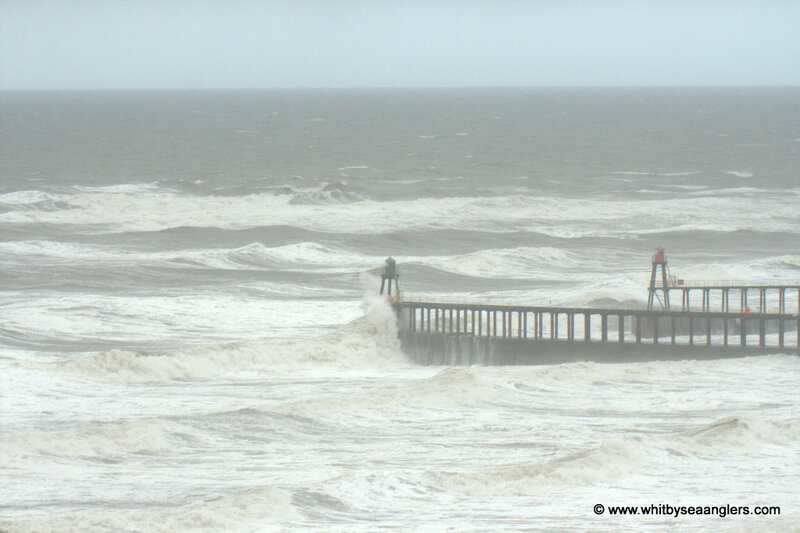 1035 mm Hg on the barometer as high pressure draws in the cold air from Siberia, as the ‘Beast from the East’ returns, but members of Whitby Sea Anglers Association were glad it was not as severe as the Met Office had forecast. With strong north easterly winds and east north east sea swell there was no colour in the water, save a little milkiness reported at certain marks. Temperatures remained steady all day at 4 deg C, with intermittent snow showers, but thankfully the wind chill was relatively mild as 16 members fished the 4 hr match right through low water enabling them to fish the gullies and tangle beds. The tide ebbed fast and this knocked off the swell quickly in some marks and the high pressure ensured the ebb was greater than 1.1 metres. By the end of the match the wind had increased and an icy shower hit the coast as members headed to the weigh station. Scott ‘Pippen’ Moore was man of the match (photograph by Peter Horbury), as he makes a end of season dash for the top, moving up another two places to 6th with 2 codling for 8 lb 15 oz. Richard Cope (photograph by Peter Horbury) landed the Heaviest Fish of the match at 5 lb 08 oz. For this time of year to have 9 members at the scales with 13 codling for 38 lb 14 oz is a welcome change from scratching for whiting in the usually flat calm conditions. Rob Allison continues his good form as his catch has closed the gap to 3 lb 05 oz behind Neil Inglis as we move into the last 10 matches of the 2013 -2013 season. Colin Stainthorpe has moved up to 10th in the leader board. Don’t leave your bait in the kitchen!! Scott 'Pippen' Moore, WSAA, Man of the Match 2 codling for 8 lb 15 oz. 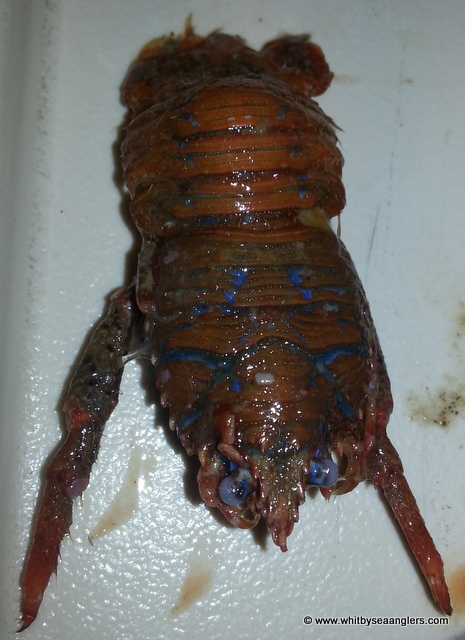 Squat lobster found inside Scotts fish. Wednesday 27th February 2013. 43 of 52. High water 17.00 hrs 5.8 metre & Low water 23.23 hrs 0.6 metre. High pressure has dominated this weeks weather, 1042 mm Hg on the barometer as the north east is in the centre of a cold high pressure system. Sea conditions were calm, with crystal clear water, with little to no close to shore swell. A gentle icy north easterly breeze with day time temperatures just above zero, but with nightfall, came the icy fog, heavy with moisture, which enveloped the east side of Whitby as a bright full moon rose above the east pier on a cloudless night. 13 Whitby Sea Anglers Association members were fishing the 3 hr match and there were some long faces at the weigh-in, as the worst show of fish this season was recorded with only 4 members at the scales with 2 lesser spotted dogfish and 4 flounders for 5 lb 15 oz. Fishing an all ebbing tide, starting 2 hrs back the tide soon ripped out leaving anglers with little option but to move marks and chase the tide. Rob Allison (photographed by Peter Horbury) was man of the match with his eighth win this season with 1 lesser spotted dogfish for 2 lb 05 oz. Rob, now only 2 lb 11 oz behind 2nd place Neil Inglis with only 9 matches left. Nice to see William Atkinson at the scales, yet to win a match this season, was 3rd for the fourth time with 2 flounders, having been 2nd just once. February draws to a close after 8 matches with 124 fish being caught for 252 lb 03 oz, in comparison 194 fish were caught in January (9 matches) for 238 lb 13 oz. Matthew Garbutt won both heaviest bag and heaviest fish sweeps for February (22 lb 11 oz & 8 lb 05½ oz) both on Sun 10th Feb. When reaching for the de-icer in the footwell, read the label before applying to the windscreen, as carpet adhesive is no substitute for de-icer! Flounder 1 lb 02 oz, caught by WSAA Chairman William Atkinson. Photograph by Peter Horbury. 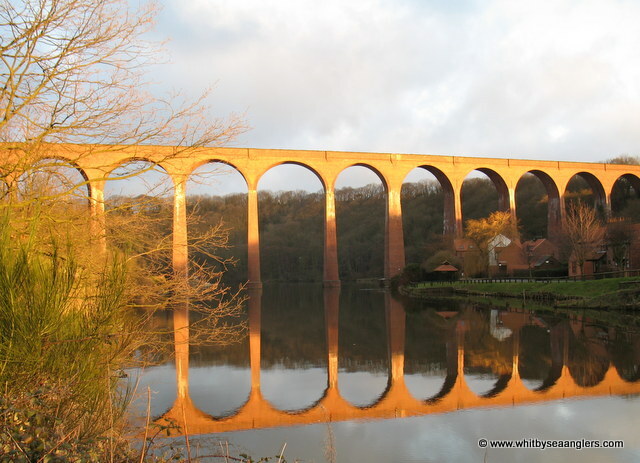 Sun sets on Whitby Viaduct at high water on the River Esk, not a breath of wind. Photograph by Peter Horbury 27th Feb. 2013. Sunday 3rd March 2013. 44 of 52. 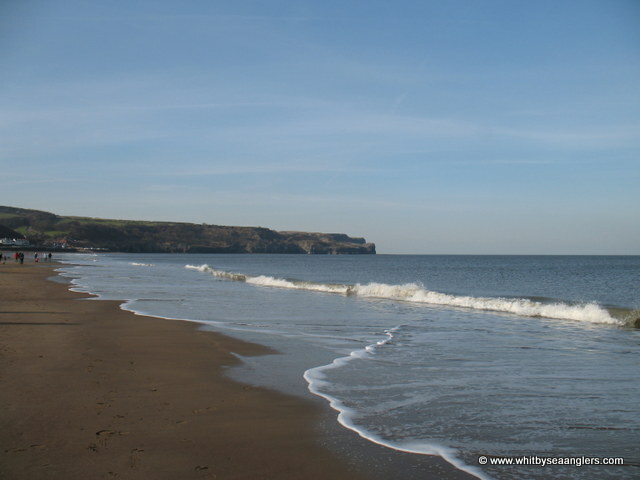 High pressure has continued to dominated the weather, the centre moving to the north west, north and then north east bringing some welcome northerly swell on Saturday, continuing for Sundays nights Whitby Sea Anglers Association 4 hr match. Sixteen members fishing 2 hrs either side of high water 5.2 metre with a gentle, but chilly, south easterly wind. Cliff marks and piers being the choice of members, with some travelling further afield, with mixed results. The first match of March and Matthew Garbutt was man of the match with his 11th win of the season, with 7 codling for 27 lb 14 oz, including one of 5 lb 07 oz, setting the bench marks for both the Heaviest Fish and Heaviest Bag sweeps. Eight members were at the scales with 23 codling for 74 lb 13 oz, an excellent weigh-in for this time of year. 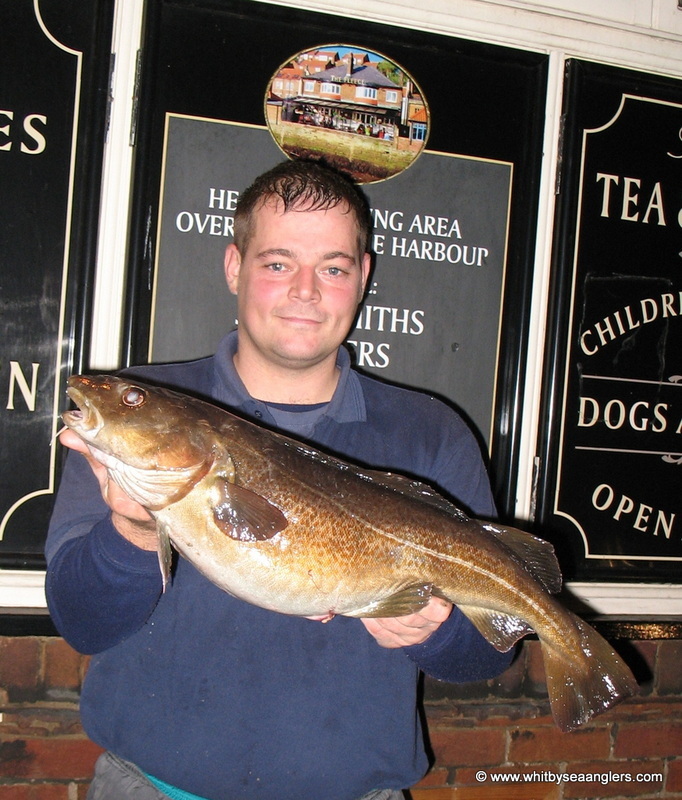 Matthew is undeniably on form and could potentially break some Club Records this season, as Whitby Sea Anglers Associations’ recorded ‘seasons best accumulative weight’ is 341 lb 15 oz, by Denis Thompson in 1984/85 season, Matthew needs 22 lb 11 oz, an average 2 lb 13 oz in each of the last 8 matches to equal this. And ditto, the record ‘fish count’ for a season is 217, by an old Whitby Sea Anglers Association member and a previous Club Press Secretary, Glen Kilpatrick in 2006/07 season, Matthew needs only 5 more fish to equal. Andrew Cass was the only ‘mover’ on the leader board moving from 8th to 6th, ahead of both Scott Moore and James Gilpin. Keep your recently bought fresh peeler crabs in a suitable container as they ‘will’ otherwise crawl away! 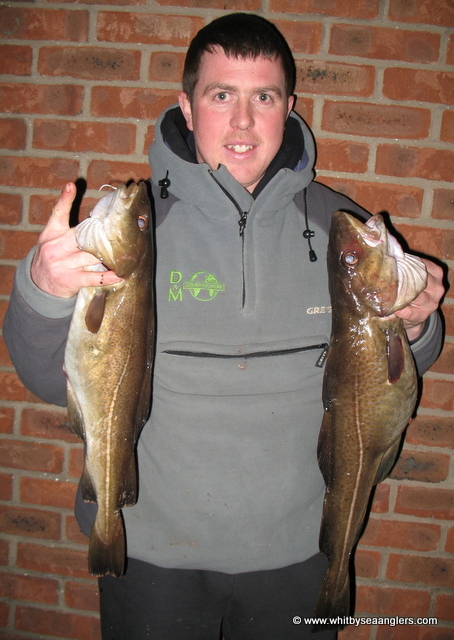 Matthew Garbutts' winning bag of 7 codling for 27 lb 14 oz, the largest (in the middle) was 5 lb 07 oz. Matthew now 158 lb 13 oz ahead of 2nd place Neil Inglis. Matthew needs 22 lb 11 oz to equal the Whitby Sea Anglers Association record catch of 341 lb 04 oz set by Denis Thompson in 1984/85 Season. Matthew needs 5 fish to equal the Whitby Sea Anglers Association record fish count for a season by an old WSAA member and a previous Club Press Secretary, Glen Kilpatrick in 2006/07 Season. Saturday afternoon 2nd March 2013. Wednesday 6th March 2013. 45 of 52. 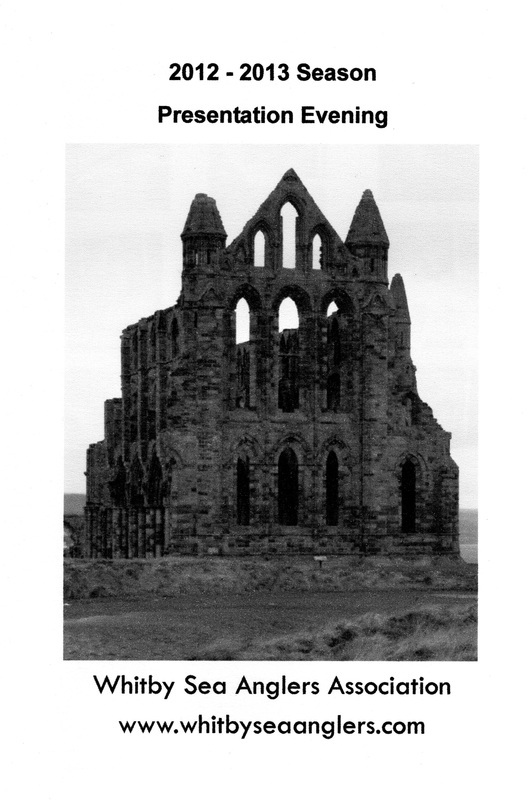 Twitter users can search #saveourstokoe and follow the Whitby Gazette @gazetteinwhitby don't forget to 'Like' our page. Low water 17.07 hrs 1.9 metre. The high pressure system that had been dominating the northeast, has been replaced with a static low pressure system, 1002 mm Hg on the barometer, with very little wind, Whitby and the surrounding area has been enveloped in a thick fog, which hindered one member as he was temporarily disorientated en-route to his chosen mark. Members of WSAA welcomed the long distance north north easterly swell which was growing as the flooding tide, on a very slack tide, took hold. 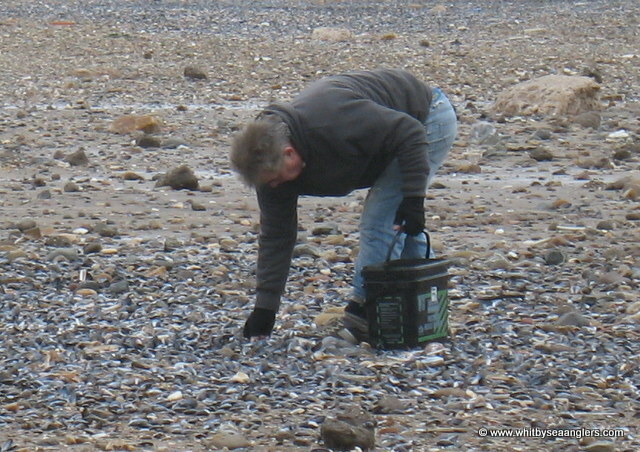 Water clarity was very clear on Sandsend beach but rock marks were well coloured, as anglers tried to take advantage of the conditions in the final month of the 2012-2013 season with only 7 matches left. As the 3 hr match got under way the forecasted easterly wind strengthened (but not enough to shift the inland fog) and thankfully the rain held off until after the match had finished. The long distance swells were intermittent and surging, which, at times caused marks to ‘white out’, not exactly favourable, but that did not deter 6 members from returning to the scales with 9 codlings for 29 lb 05 oz. The heaviest fish, 7 lb 02 oz, now the Heaviest Fish for the March sweep, fell to Dave Perrett whose 2 codlings for 8 lb 08 oz won him the match. This was Dave’s third win of the season and his 2nd heaviest single fish, his heaviest being 7 lb 12½ oz caught on 5th December 2012. The only ‘mover’ on the leader board was James Gilpin as he regained 7th place from Scott ‘Pippen’ Moore. Members are reminded the Fleece re-opens its doors this Friday 8th March 2013. *heaviest fish 7 lb 02 oz. Sunday 10th March 2013. 46 of 52. High water 15.01 hrs 5.5 metre & low water 21.26 hrs 0.8 metre. 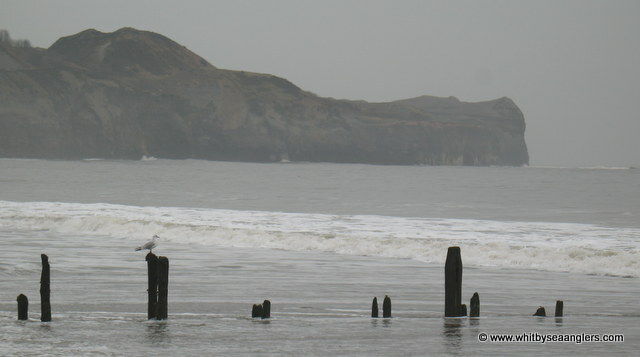 North easterly swells 7 ft to 10 ft and east north easterly winds 29 mph forecast. Pictures of Fri 8th Mar. Pictures for Sat 9th Mar. Pictures for Sun 10th Mar. Snow forecasted for the north east on Sunday, temperature 3 deg C, but factor in the wind chill -3 deg C.
Don't be fooled by the sunshine, zero deg C and a bitter easterly wind! 0930 hrs this Sunday morning horizontal snow showers, with a bitter easterly wind, zero deg C. 1015 mm Hg on barometer and rising. 1710 hrs 10th March 2013, first heavy snow shower hits the coast line. Photograph Peter Horbury en route to chosen mark. The weather during March is one of the most extreme and varied months for British weather, with the predicted easterly cold snap bringing bitterly cold conditions and snow showers as the 'Beast from the East' returns for a third time!! Whitby Sea Anglers Association members watched closely as the sea conditions grew from Friday onwards as the mercury rose. 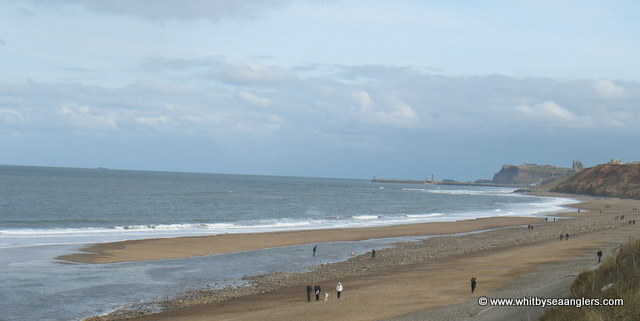 Sunday was a bright sunny day but temperatures did not move above zero and with nightfall, fell to -3 deg C. East north east 10 ft swells and wind strength at nearly 30 mph. 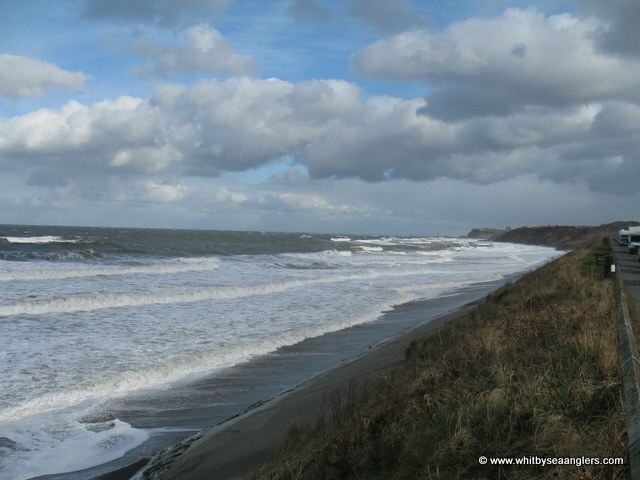 By 1700 hrs the first of the snow showers hit the coast line, with drifting snow between East Barnby and Mickleby. Sixteen members were fishing the 4 hr match and only 3 members were at the scales with the 2nd worst weigh* in this season, 3 codlings for 9 lb 12 oz. 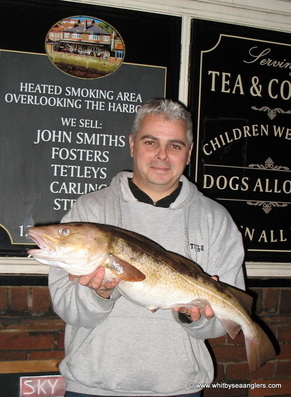 Colin Stainthorpe was man of the match with his second win of the season with a codling of 4 lb (last win 4th November 2012). By 2015 hrs conditions got worse, the wind and sea swell was growing. The wind and tidal ebb were fighting for dominance with swell surges followed by large draw back, sucking end tackle into snags. Weed was reported a problem at the start of the match, wind strength kept lines well bowed and bite detection was hard with fish found to be ‘laid on’. Wind chill on wet fingers made baiting up painful and speed was of the essence with the icy cold dry wind at times took ones breath away. By 2100 hrs many members were on their way home as marks became unfishable on such a big ebb tide (Low water 21.26 hrs 0.8 metre). This ‘Siberian spring’ is set to be with us for the next week moving round from the east to northerly's This morning 1020 mm Hg on the barometer, - 2 deg C, a bitter easterly wind and snow showers this morning. Records* to beat for Matthew Garbutt. Denis Thompson 341 lb 15 oz - 1984/5 season. Glen Kilpatrick 217 fish - 2006/7 season. *known at the time, as some years are missing. Wednesday 13th March 2013. 47 of 52. 8am this morning, walk on the beach with Aussie. - link. Low water 23.20 hrs 0.7 metre. Whitby awoke to a dusting of fresh snow and the snow showers continued all day. A bitterly cold north westerly wind and a day time temperature just above zero. The sea state was long distance northerly swell with little colour. 0.7 metre) Whitby Sea Anglers Association members would again be chasing the tide with the constant threat, from a darkening sky, of more snow. 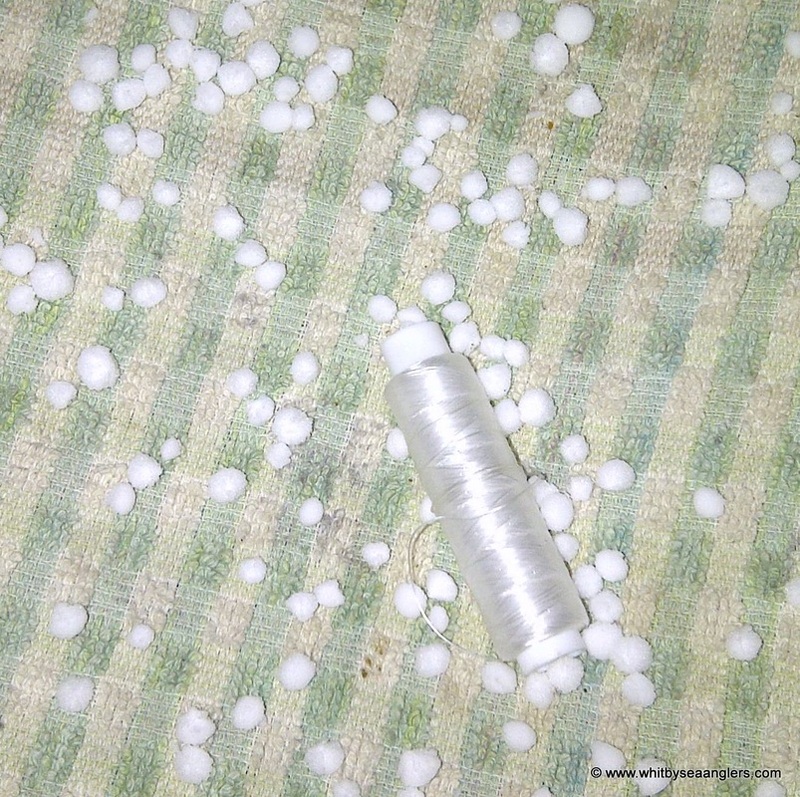 And snow it did for all, 10 mins before the match started, I was caught in a hail storm, the size of the stones made for a painful experience, fresh water breaks down lugworms (osmosis) quickly covering them with a rag (photo below). Bernard Vasey at the scales. ‘Two fish or not to fish’ was both the answer and the question at the weigh station as members all longed for the end of the season. 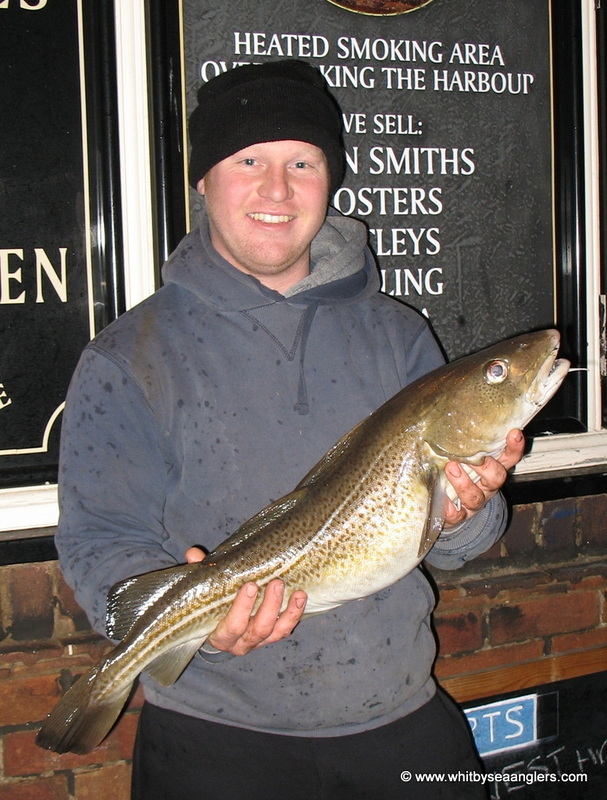 Fishing is always hard in March and Whitby Sea Anglers Association members recorded the worst weigh in, with only 2 codlings for 4 lb 10 oz gracing the scales by Matthew Garbutt 2 lb 11 oz and Neil Inglis 1 lb 15 oz. Matthew recorded his twelfth win this season and just needs 2 fish to equal the current WSAA record set by Glen Kilpatrick in 2006/7 season. And 14 lb 12 oz to equal the 1984/5 record set by D Thompson, in the 5 remaining matches. Neil recounted how he had decided to have another cast, as there was, at that time, no need to make the weigh in on time. As luck and fate would have it he caught his fish and then had to scurry across the scars back to his car, making the weigh-in in plenty of time to take his sixth 2nd place this season. 13th March 2013. High water 16.59 hrs 5.8 metre & low water 23.20 hrs 0.7 metre. 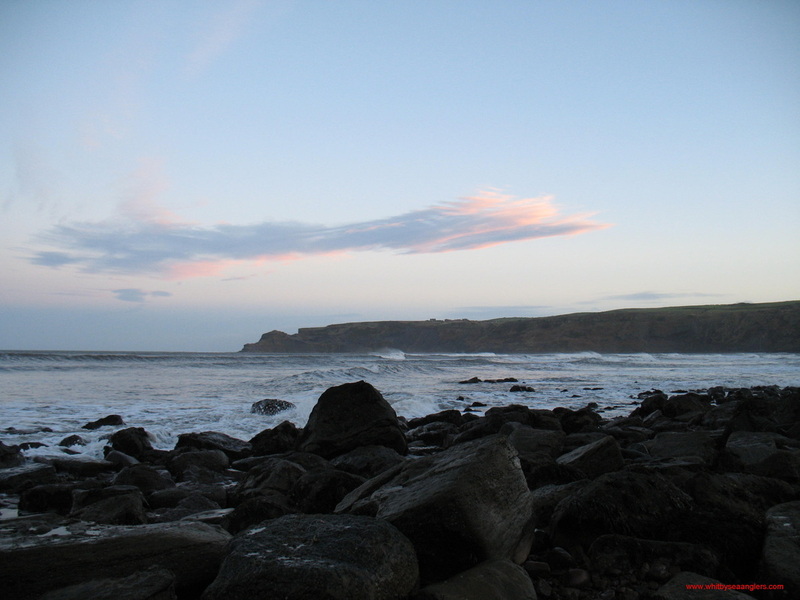 This is the link to the proposed Marine Conservation Zone from Sandsend to Staithes (See News). Fresh snow this morning, north westerly wind, northerly swell. 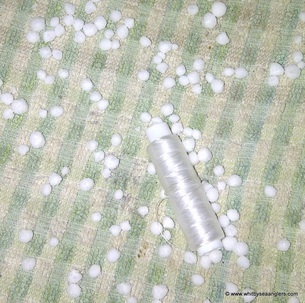 Mercury is dropping, now 1014mm. Fished ebb to low water last night (12th March) 3 1/2 hrs, conditions were spot on. 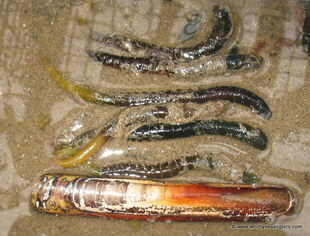 Freshly dug black lug and peeler (frozen), only one 7" codling, (lip hooked) came out. Sunday 17th March 2013. 48 of 52. Sea state at 17.00 hrs Sunday 17th March 2013. Friday 14th March 2013 was Comic Relief, but which member of Whitby Sea Anglers Association is doing something funny and to be congratulated for raising money for a good cause in his Friday night gear? High water 19.22 hrs 4.9 metre. Low pressure 995mm Hg brought a calm and clear sea state prior to Sundays 4 hr match, as the Whitby Sea Anglers Association season draws to a close, day time temperature 4 deg C. By the start of the match, conditions were changing with a little long distance south easterly sea swell and a chilly south easterly breeze which was forecast to move to the east and strengthen bringing more wintry weather. Over high water, 19.22 hrs, the swells were growing, as was the wind and the wind chill, with the occasional icy rain shower. Bites were scarce due to the clear water conditions and the strong wind lead to bowed lines and end tackle being dragged into snags. Small fish gave false bites with some undersized billets and rocklings being returned. The weigh-in was carried out under an umbrella, in the car park next to the Fleece, as heavy icy rain and sleet hit the coast line shortly before the end of the match. Dave Perrett was man of the match, repeating his knack of 6th March and catching a fine codling of 4 lb 12 oz on his last cast, making a late charge for 4th place. Dave is now only 8 lb 07 oz behind Dave Hambley. In total only 3 members returned to the scales with 2 codlings and a dab for 7 lb 11 oz, all agreed is was hard work and longed for the end of the season. Matthew Garbutt increased his fish count with a codling of 2 lb 08 oz, now needs one more fish to equal the current WSAA record of 217 fish. And 12 lb 04 oz to equal the long standing 1985/85 seasons record catch. But with these extreme and varied winter weather conditions for March set to continue until April it may stand for another year. 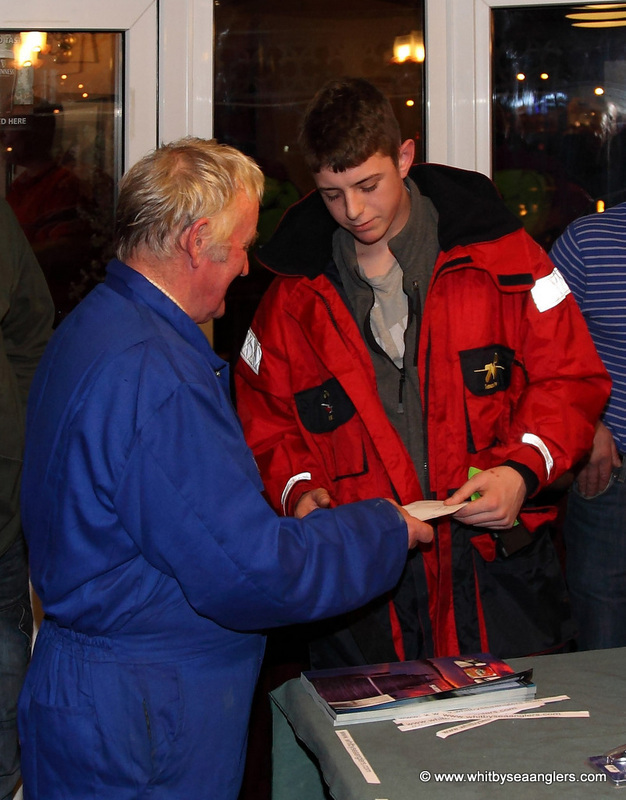 Whitby Sea Anglers Association Presentation night, The Stables 20th April 7.45pm for 8.15pm. Members are asked to make their menu choices and make payment by the seasons end. 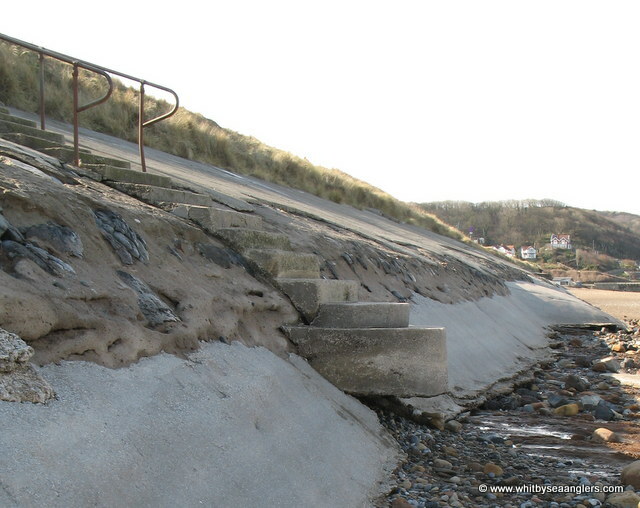 The rough seas of last week have removed all the sand from beneath these access steps. Wednesday 20th March 2013. 49 of 52. 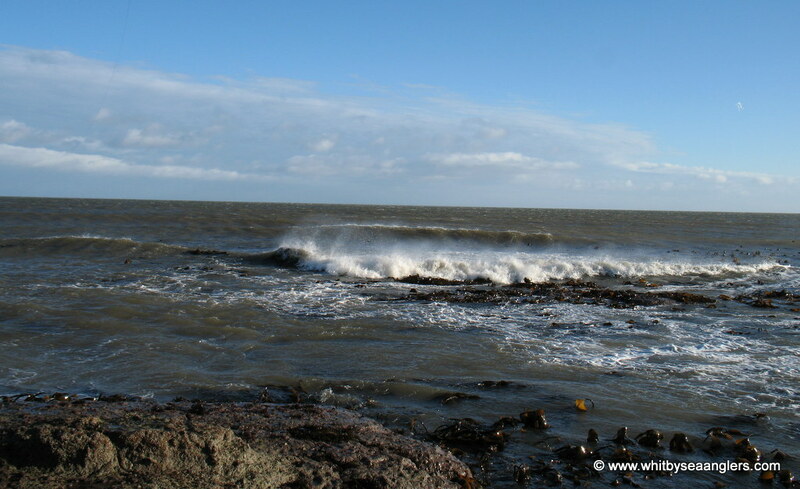 The low pressure system brought cold easterly winds on Monday and stirred up the sea swell to a strong easterly but the water was crystal clear, a phenomenon which as yet no one seems to have a definitive answer to. 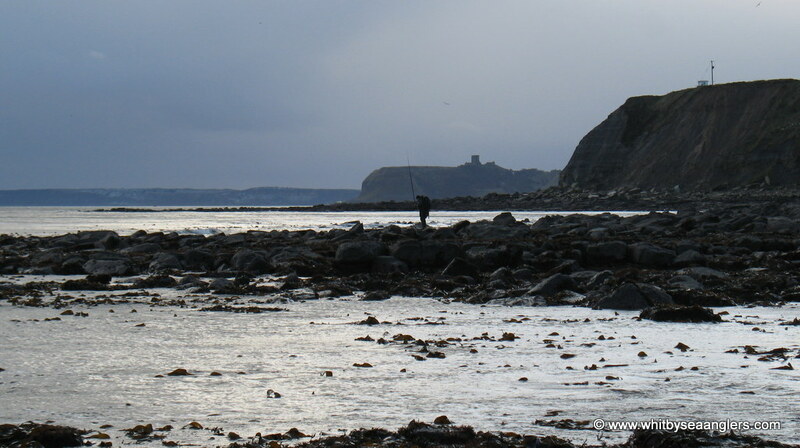 Steadily the mercury rose and by Wednesday (spring equinox) morning was 1012mm Hg, as high pressure returned, with snow forecast for the north east, which thankfully held off as Whitby Sea Anglers Association members prepared for the 3 hrs evening match. It was an all flood match with high water 4.0 m at 22.15 hrs and members all agreed the sea swell was growing which lead to end tackle being dragged into snags, with heavy loses. Five members were at the scales with 6 fish for 20 lb 08 oz. Neil Inglis reported losing a good fish which played him for 20 mins, he was unable to ‘lift’ the fish and eventually snapped his line in the back wash. There is no denying Matthew Garbutts’ knowledge and dedication to match and pleasure fishing as took his 13th win of the season, and man of the match. The camaraderie and sportsmanship at the scales from fellow members was overwhelming, as he placed 2 codling on the scales for 9 lb 14 oz. Seeing the heaviest fish on the scales “looks like a photo opportunity Matthew?” “Sure no problem Peter”. Photographed here by Peter Horbury holding his 218th fish for the season, 6 lb 03 oz. The record book for the ‘seasons fish count’ is now being written, his second fish of 6 lb 03 oz was his 218th fish, with 3 matches remaining, from all at Whitby Sea Anglers Association congratulations Matthew. The name ‘equinox’ is derived from the Latin ‘aequus’ meaning “equal” and ‘nox’ meaning “night”. In a broader sense ‘equinox’ can also mean the date when such a passage happens. 20th March 2013 will be remembered as Matthew Garbutts’ Equinox. Wednesday 20th March 2013, high water 09.26 hrs, 2 deg C 1012mm Hg - bitter easterly wind and water still gin clear!! Sunday 24th March 2013. 50 of 52. Bitterly cold easterly winds continued to batter the north east coast, as the barometer nudged 1022mm Hg and the easterly sea swell was growing with the wind strength. The ebbing tide into a flooding tide, was 4 hrs back as Whitby Sea Angler Association members started the 4 hr evening match, with low water at 20.22 hrs 1.4 metre. The fierce easterly wind made casting very difficult and at times hard to stand up as members followed the tide into more exposed areas on the scaurs away from the shelter of the coast line. With little cloud cover and a near full moon the bright moon did not help, the water clarity slightly milky. Wind chill hampered baiting up, as the day time temp just above freezing. 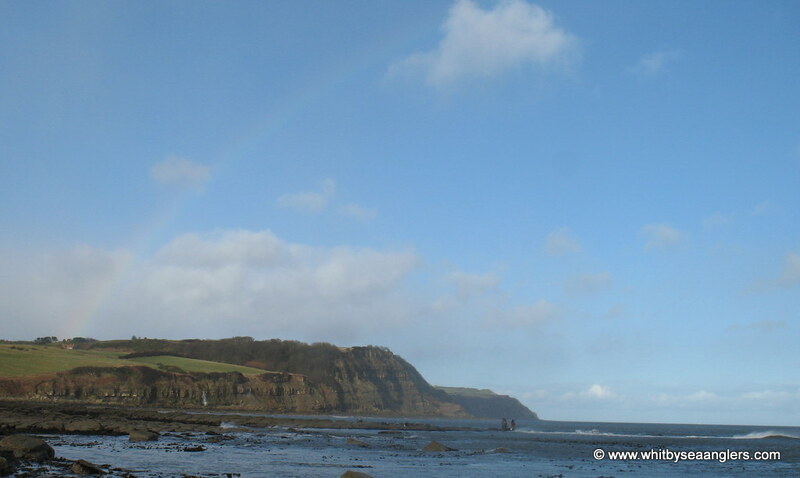 Robinhoods Bay was full of weed, totally unfishable, and members had to change marks which cost fishing time. Unfortunately one member reported finding a dead dog. Only three members returned to the scales with 5 codlings for 11 lb 04 oz. Man of the match was Neil Inglis, 2 codlings for 5 lb, this his 4th win of the season. Ben Laws, yet to win a match, was second, this his 3rd second place this season with the heaviest fish of the night 3 lb 09 oz. Matthew Garbutt continues to find the fish even in the most inclement of conditions, taking his fish count to 220 and total season weigh in to 342 lb 04 oz and still two matches before the season finishes. 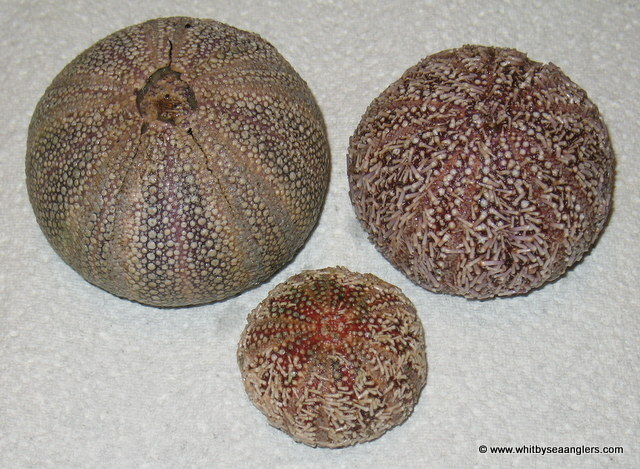 Down at Runswick Bay there were numerous Sea Urchins and a porpoise washed out along the shore line, loose weed was a problem in the surf but moving 50 or so yards it was fishable, but alas no fish, not even a bite! At the end of the match the coast road was closed at Mickleby due to a serious road traffic accident and members were diverted to the moor road, but with members leaving their marks early due to poor fishing the conditions, no one was late for the weigh in as it started to snow. Wednesday 27th March 2013. 51 of 52. 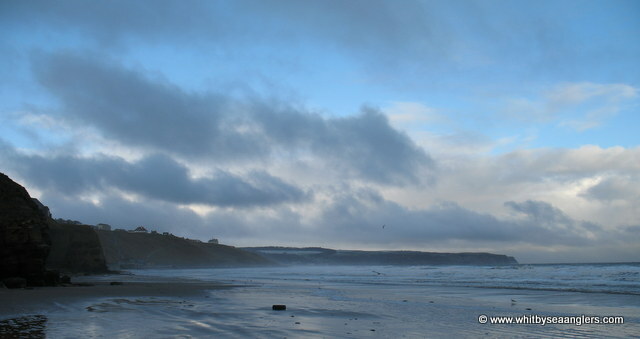 Sandsend 1800 hrs, calmer sea, still easterly and very cold, 1 deg C and fresh bait from a recent 'wash out'. The penultimate match and weather wise it is déjà vu, as the bitterly cold easterly winds continue to hit the north east coast, although not as strong as Sunday, predictions are, it will be with us for a while longer. The barometer still around 1020mm Hg and the easterly sea swell is still with us but again not as strong as on Sunday. Water clarity is still a problem as there is no colour in the water on any marks. Driving to their marks members of WSAA reported the temperature at 1 deg C, with snow showers all along the coast. Again wind chill was a problem whilst baiting up and as the match progressed there was virtually a continuous dusting of light snow showers. The tide ebbed fast and members were able to branch out onto the numerous marks on the scaurs and fish the gulley’s and tangle beds. Expectations were understandably low and the weigh in proved this, as only 2 members weighed in and man of the match was Scott ‘Pippen’ Moore with a codling and a billet for 2 lb 03 oz and Dave Hambley was the only other member with a pouting for 08 oz. Total weigh in, 3 fish for 2 lb 11 oz, which is now the worst this season, this relentless cold snapped and easterly seas has pushed the fish into deeper water. Sunday is the last match of the 2012 - 2013 season, the clocks go forward, meaning an extra hour of day light for the night match, the weather is not due to change for the foreseeable future, throw in the last 2 hrs of a flooding tide to high water at 19.45 hrs 5.5 metre, followed by 2 hrs of ebb, and members are not exactly enthralled at their prospects of a grand finale. Some members have already hung up their rods but there is still a battle for 7th place as James Gilpin is only 05 oz ahead of Scott Moore. 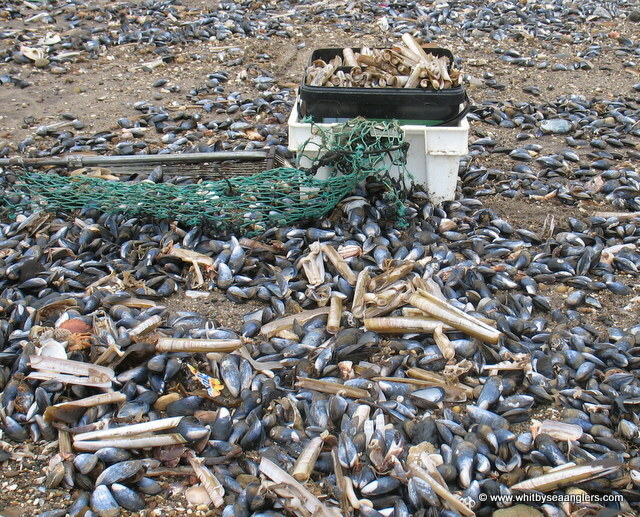 Persistent easterly seas proved too much for shell fish and a 'wash out' piles it all up on to the beaches, plenty for all. Officers from the Fisheries were out in force confiscating all lobsters (100's) and inspecting permits!! 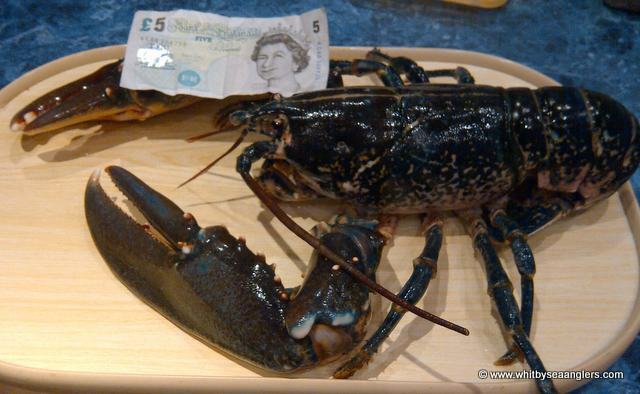 No permit, No lobsters. This is my mate Lob, he weighed in at 4 lbs. North Eastern Inshore Fisheries and Conservation Authority. Sunday 31st March 2013. 52 of 52. Quote "Well done to all you guys on another great season and thanks for sharing the results and pictures, just a shame we can't get the same from that idiot Peter Horbury who seems to be ruling the roost at the Whitby Fishing Club." Baramundi Bob. With comments like that Baramundi Bob you've answered your own question. The Final Match of the 2012 - 2013 Season, the 4 hour evening match started at 6pm, fished over high water, the last 2 hrs of flood, 2 hrs of ebb and still daylight until 2030 hrs. With no colour in the water, the easterly sea swell that has been with us for some time had been slowly dropping away, the wind was moving a little to the south, day time temperatures were just above zero, typically once the match began so did the occasional snow shower. 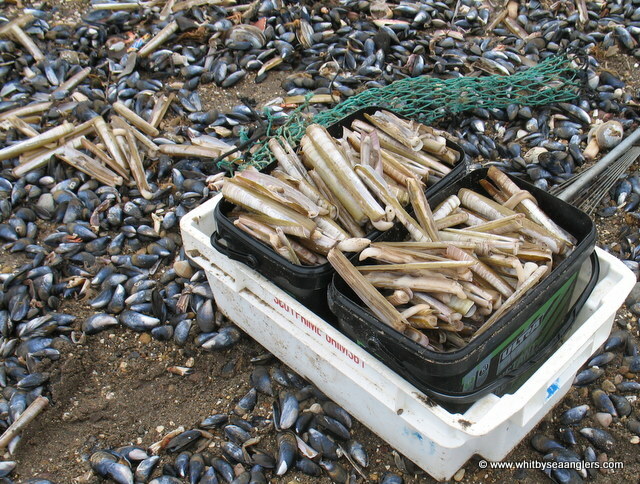 The persistent easterlies and cold climate of late has pushed both the feed and fish into deeper waters as members reported small fish bites but baits were untouched by crabs. 2 lb 05 oz. Luck was on Dave’s side as he found the last parking space at his chosen mark! Congratulations to Matthew Garbutt who has won for the 2nd year running, catching 220 fish for 342 lb 04 oz. Unfortunately no records as previously reported for Matthew as Denis Thompson claimed his weights for the 1986/87 season were higher (the accumulative record for this season is missing), so on examining and recounting the figures from the ‘ledger’, it was proved Denis had 249 fish for 344 lb 03 oz in the 1986/87 season. Apologies to all. 7 lb 02 oz, caught on the 6th March and Matthew Garbutt the heaviest bag of fish 27 lb 14 oz, caught on 3rd March. In total the members of Whitby Sea Anglers Association caught 59 fish for 165 lb 13 oz in March, bringing the seasons total to 1,208 fish for 1,815 lb 11 oz. Members next meet for the presentation night at the Stables, 20th April. 7.45pm for 8.15pm.